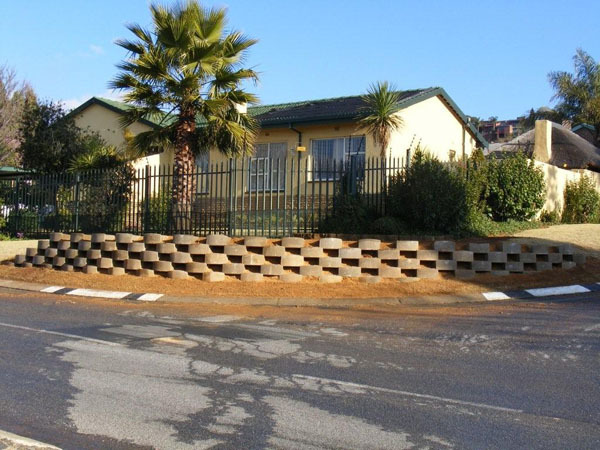 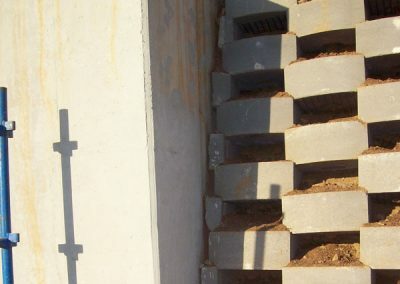 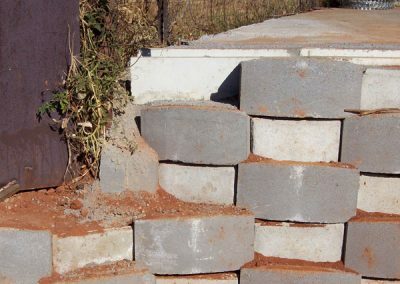 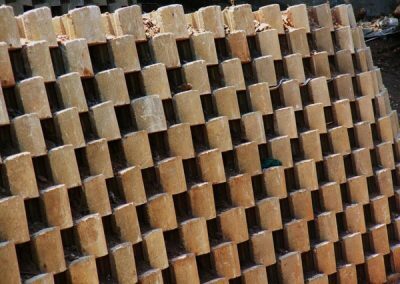 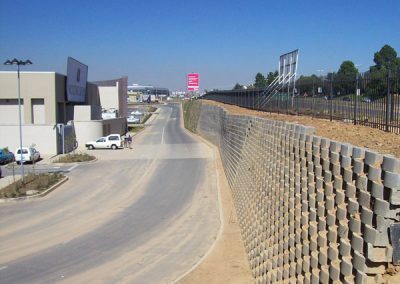 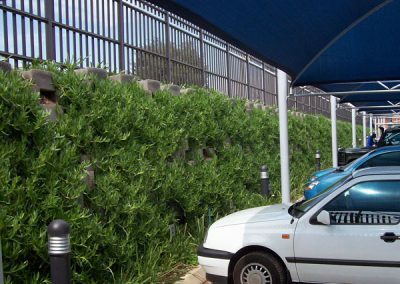 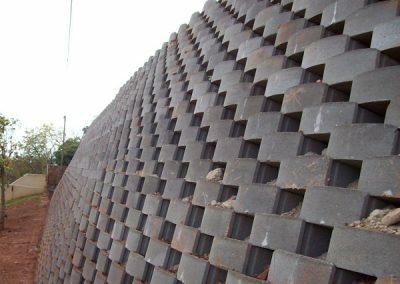 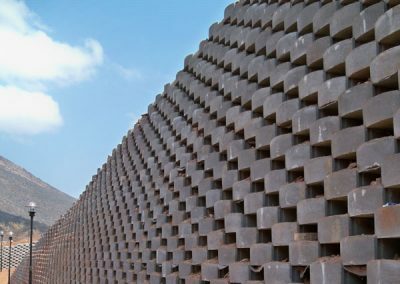 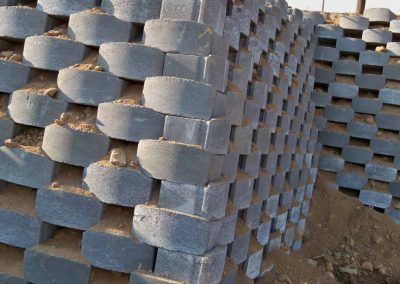 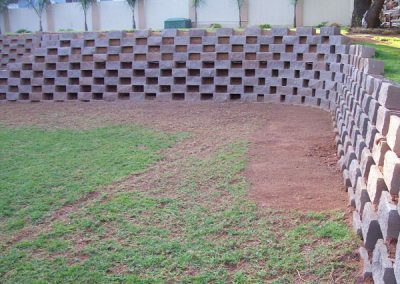 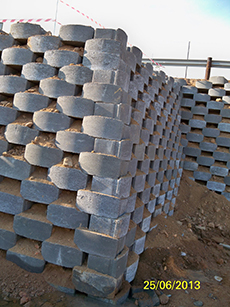 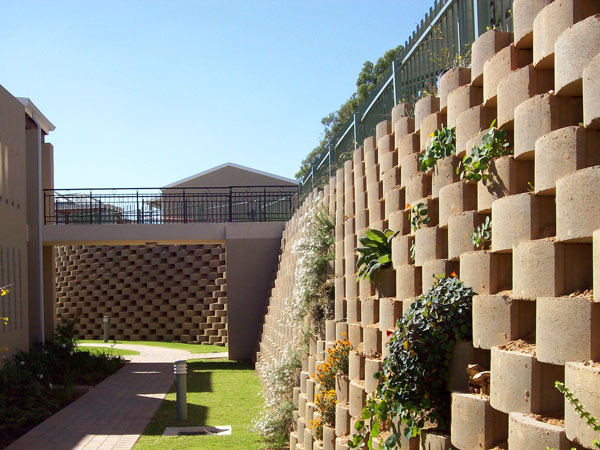 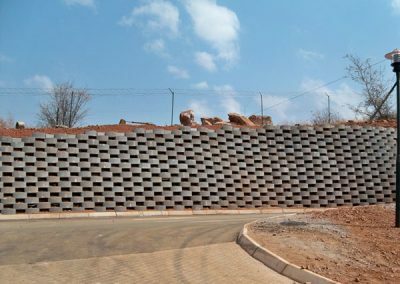 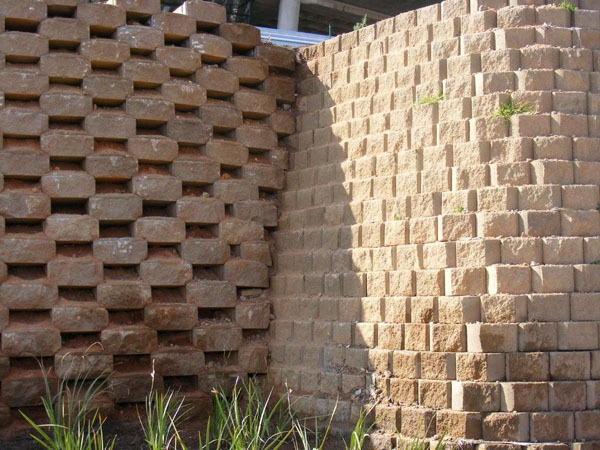 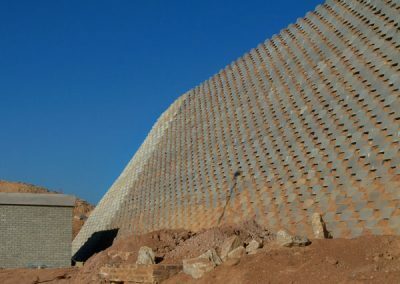 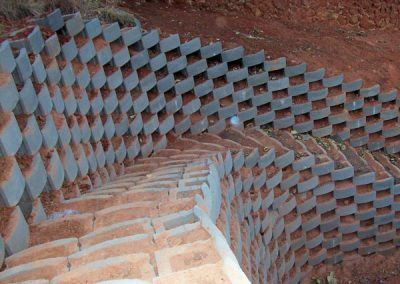 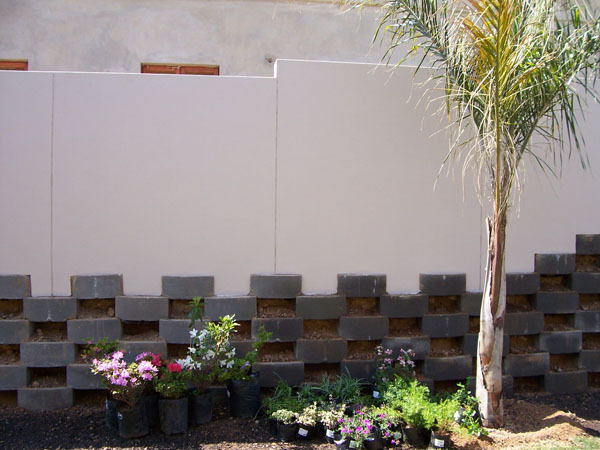 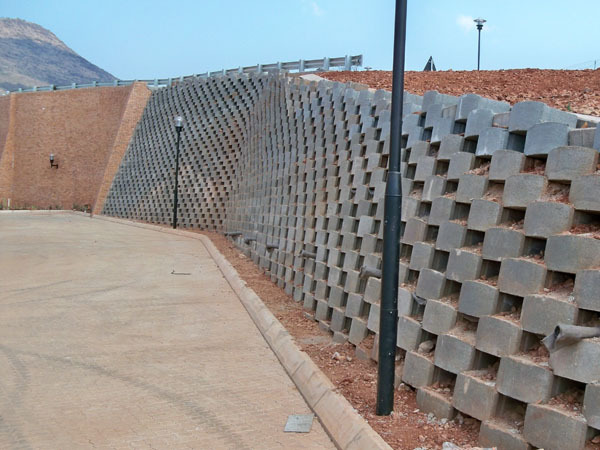 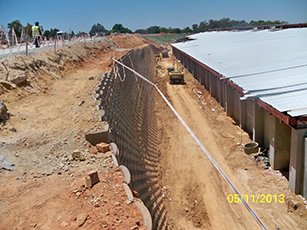 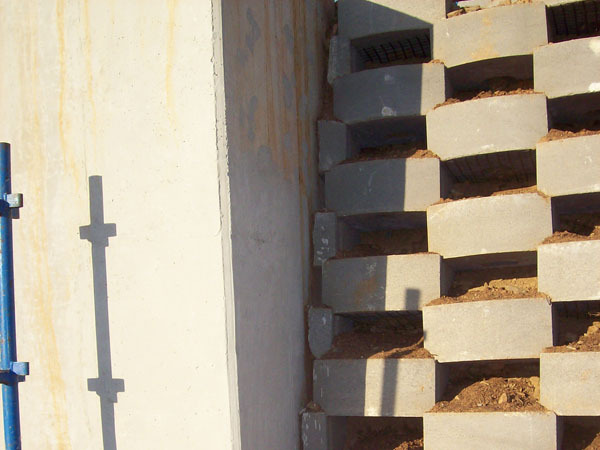 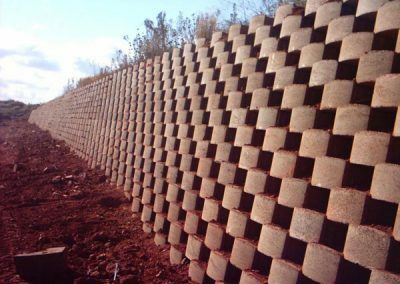 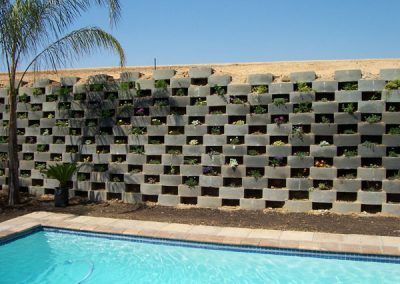 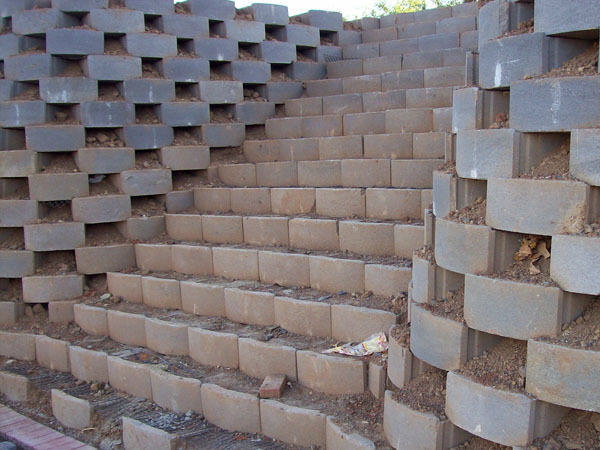 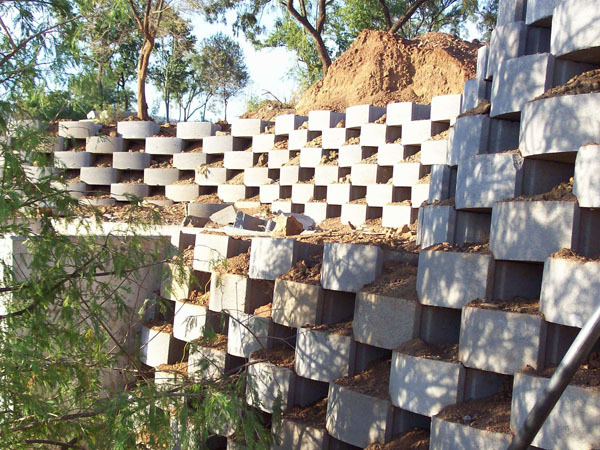 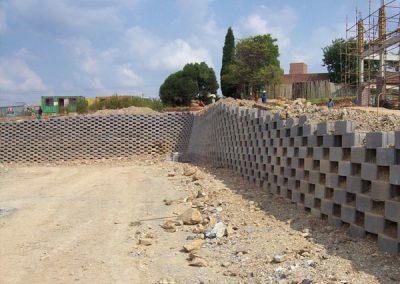 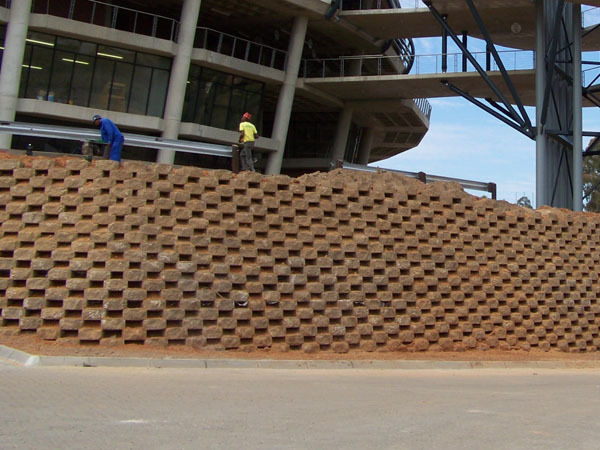 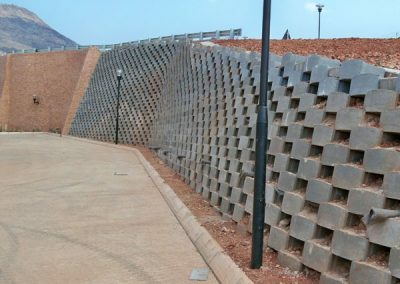 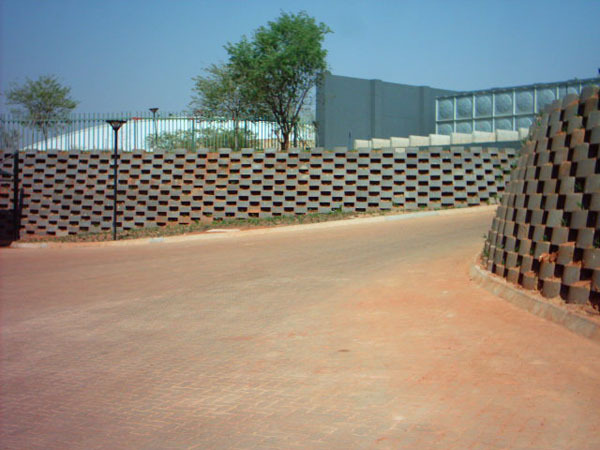 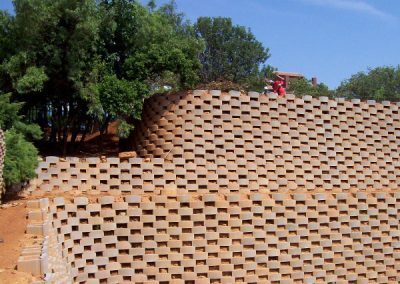 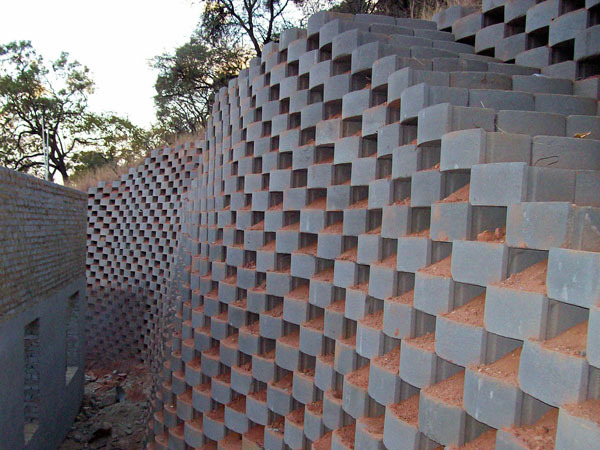 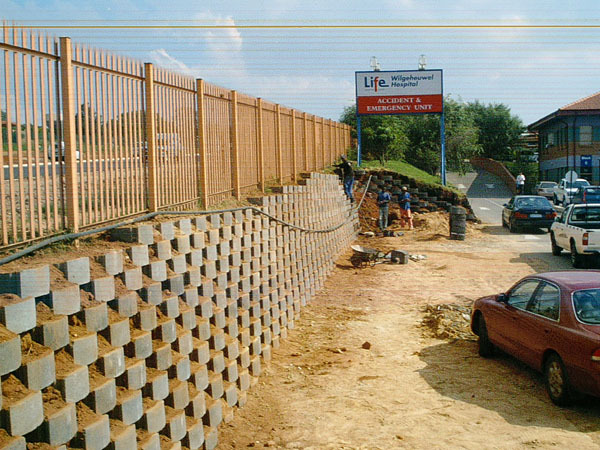 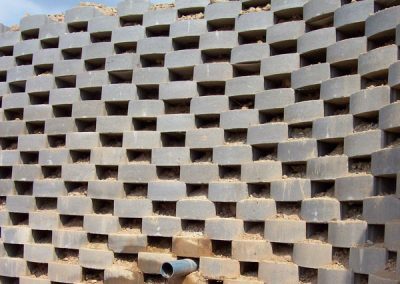 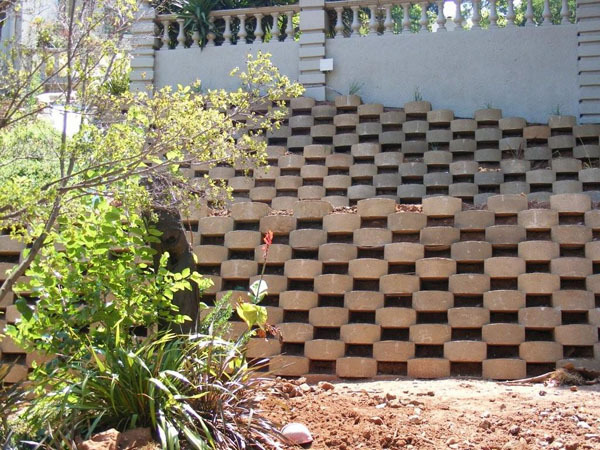 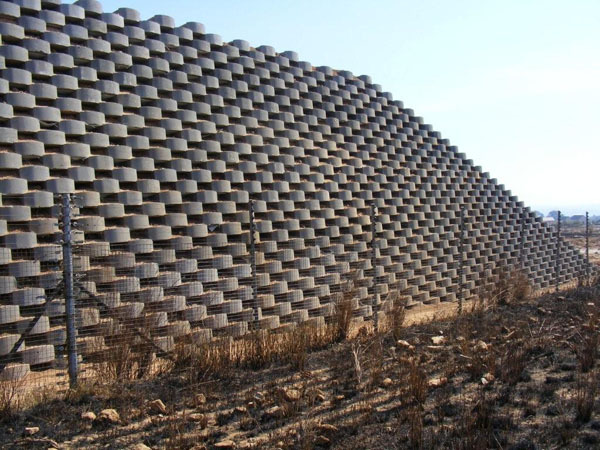 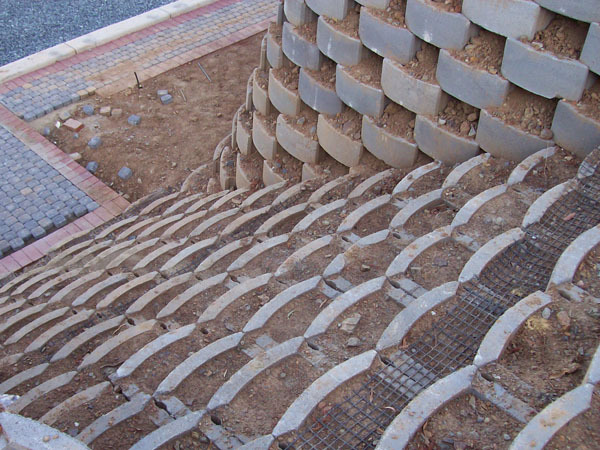 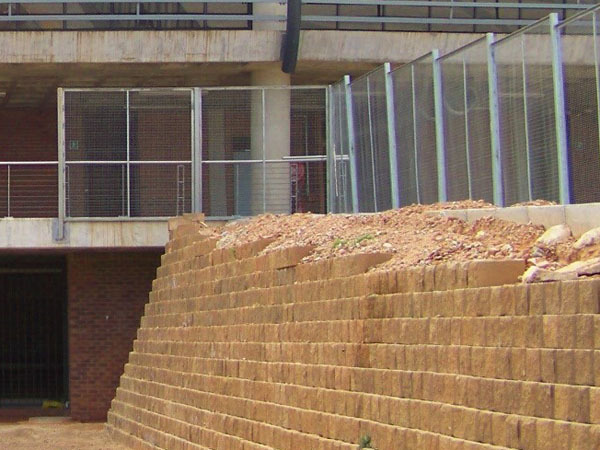 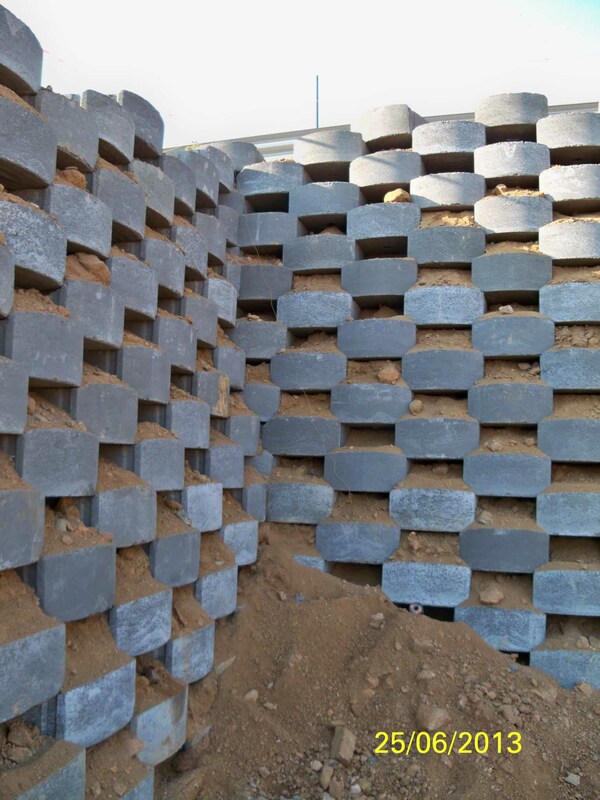 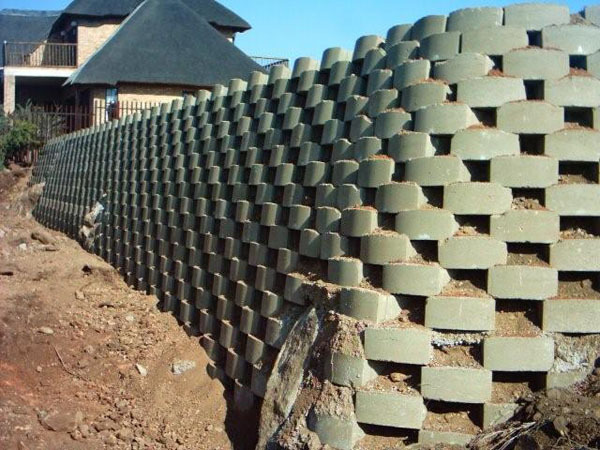 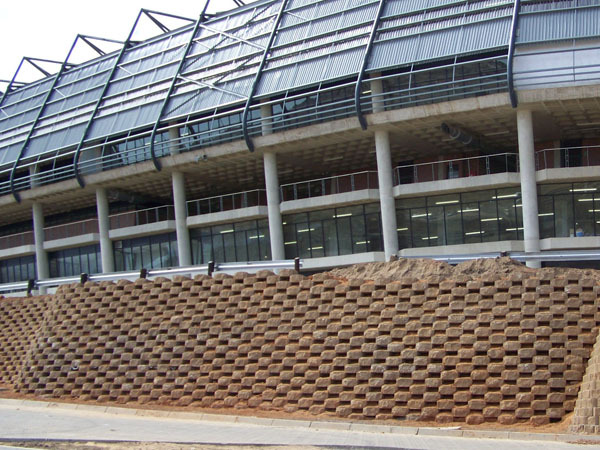 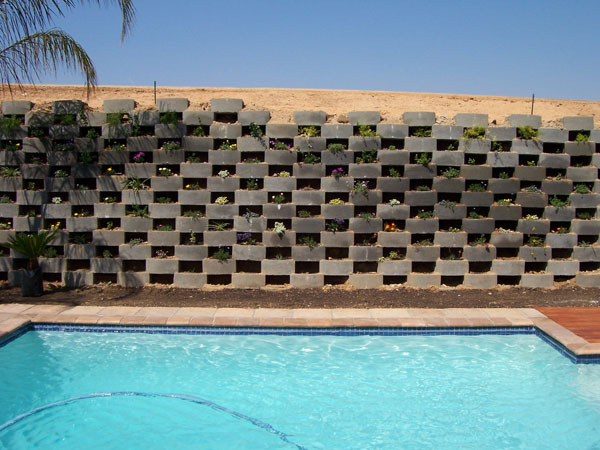 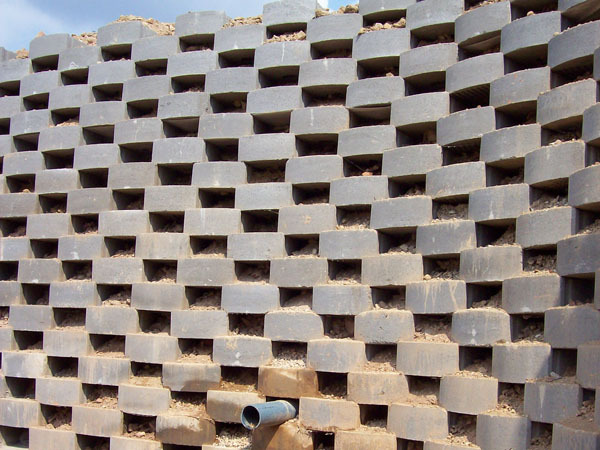 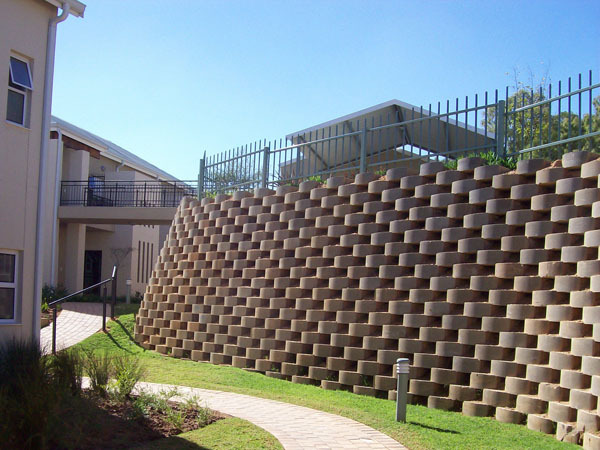 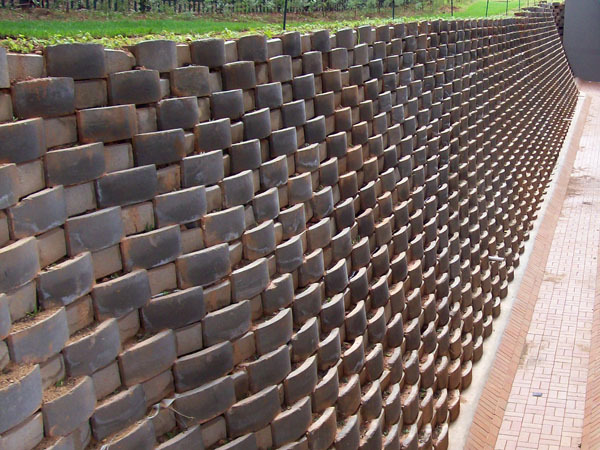 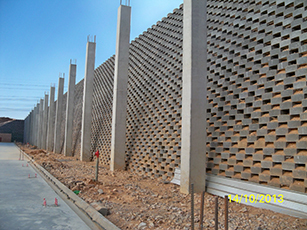 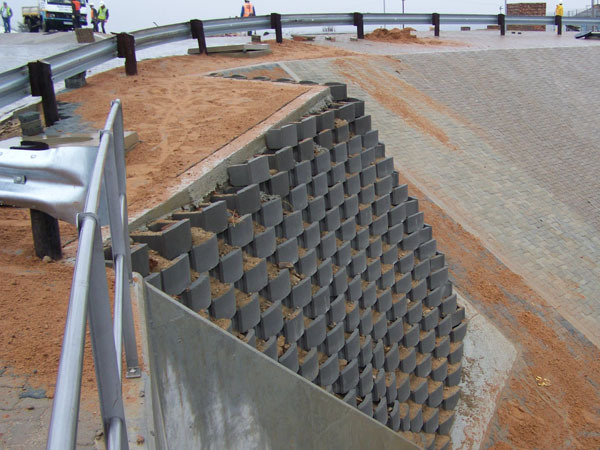 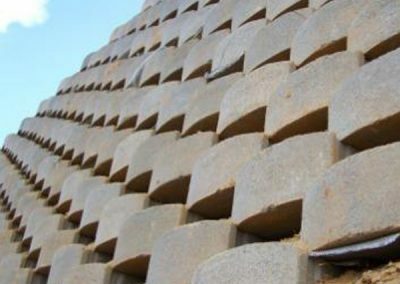 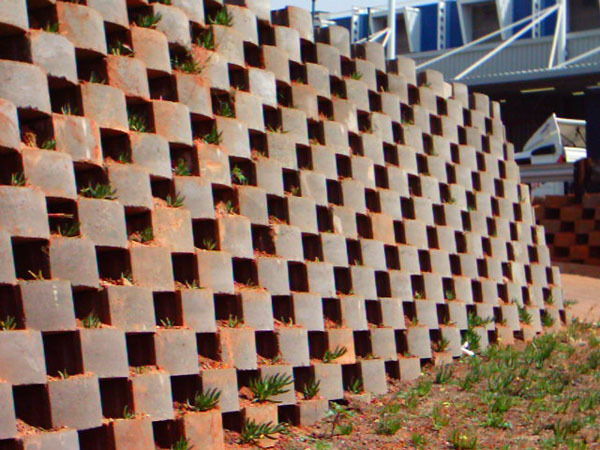 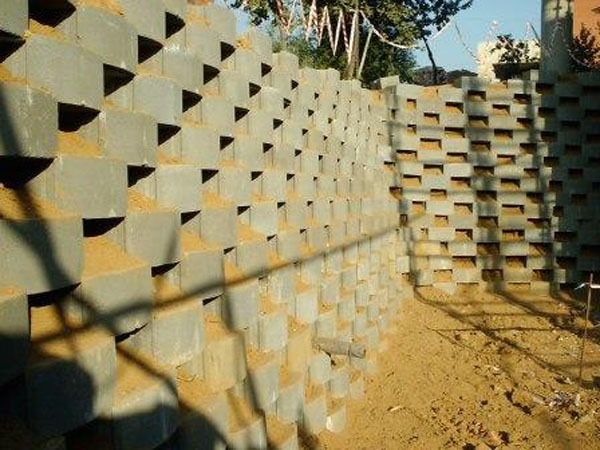 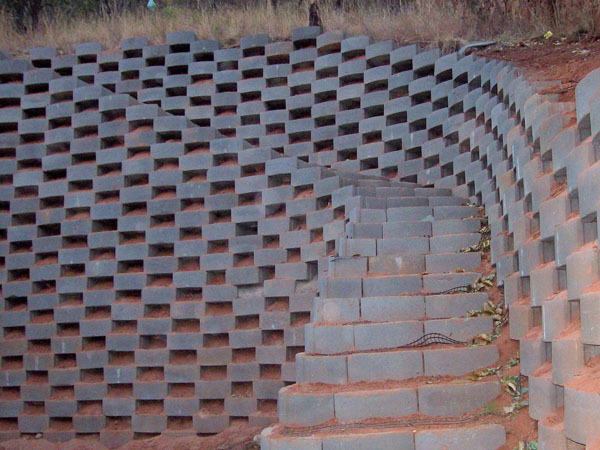 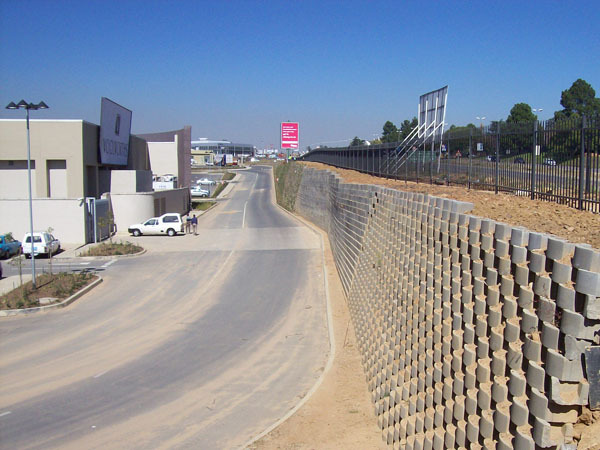 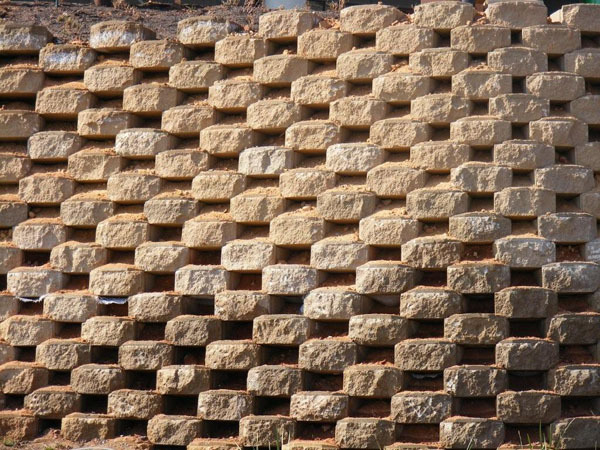 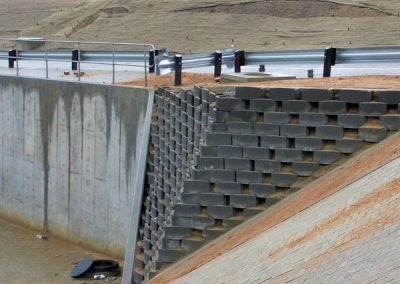 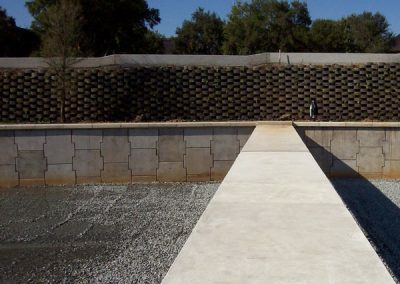 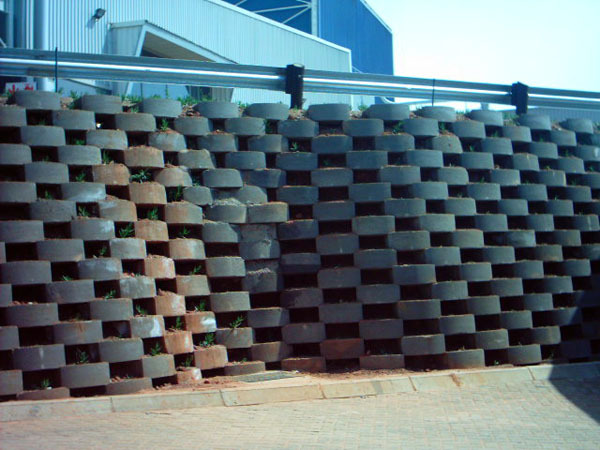 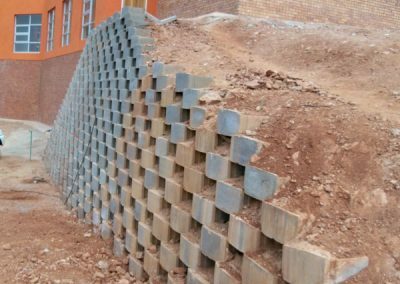 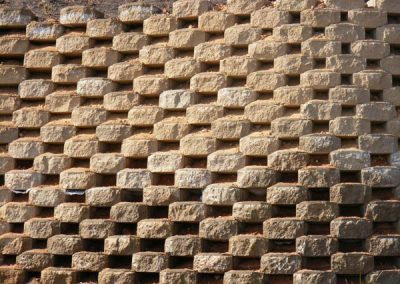 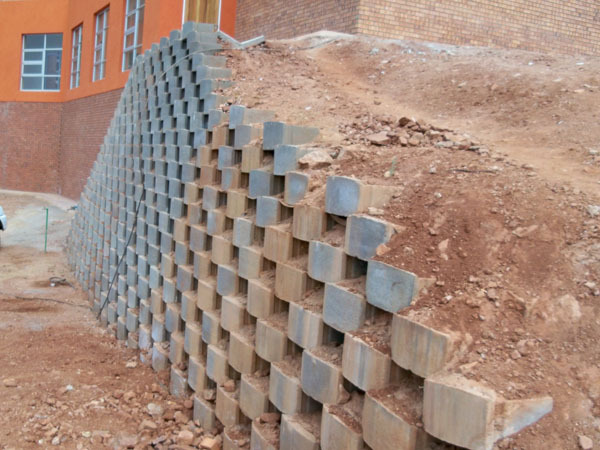 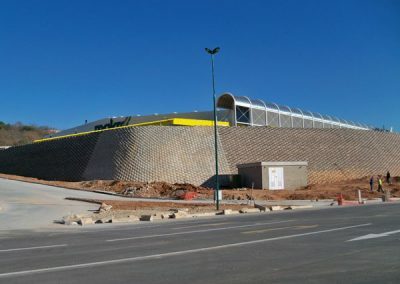 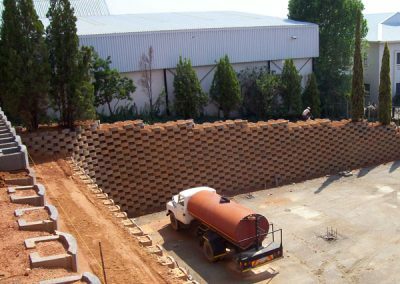 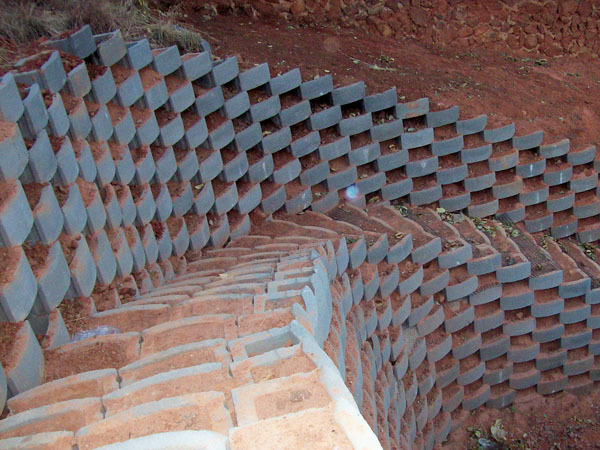 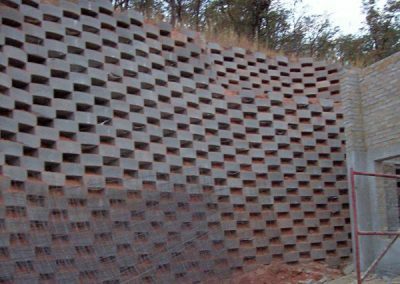 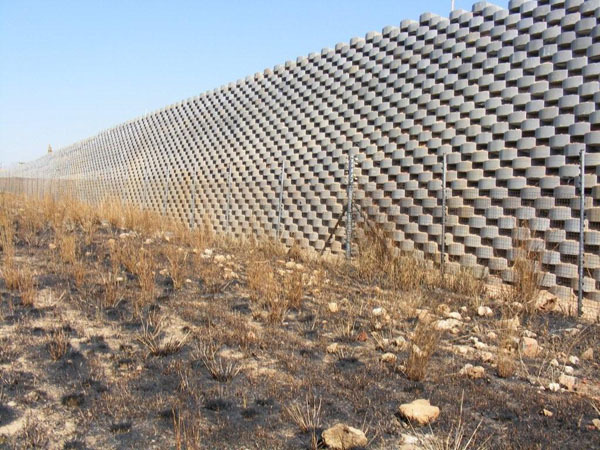 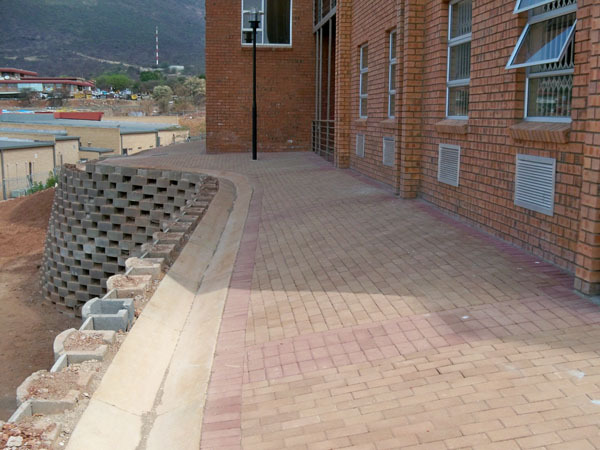 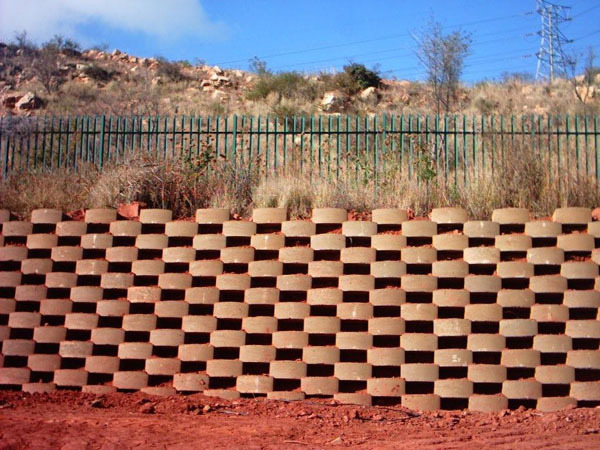 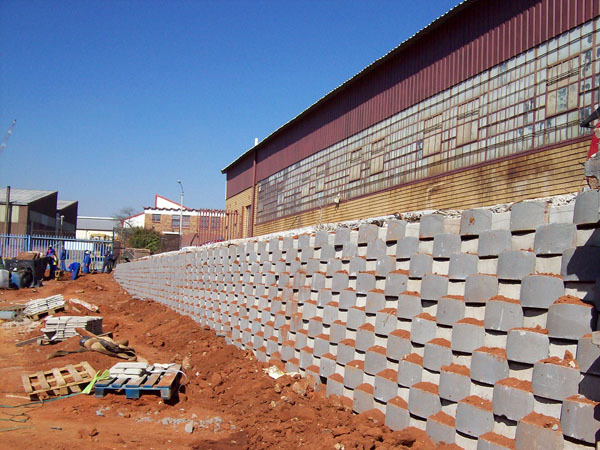 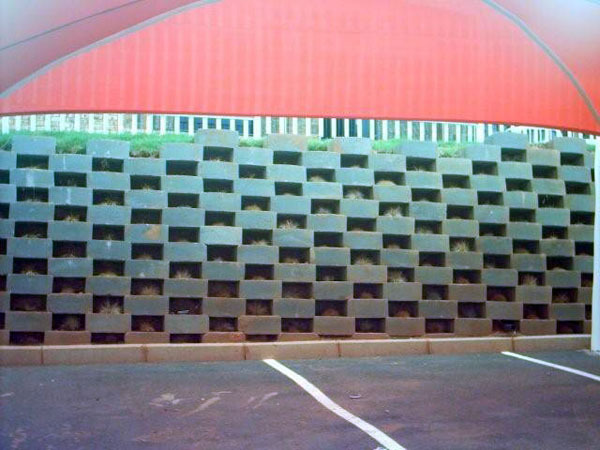 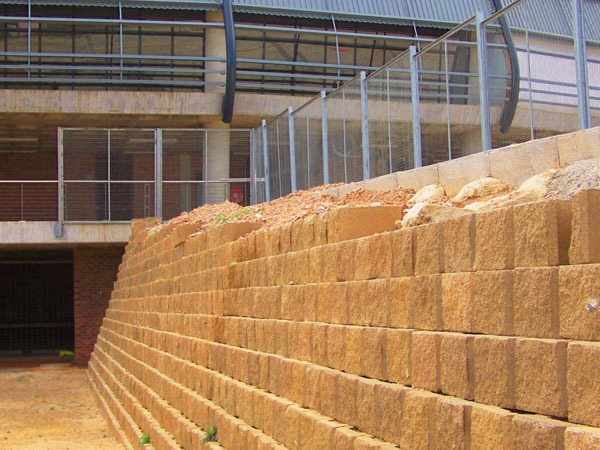 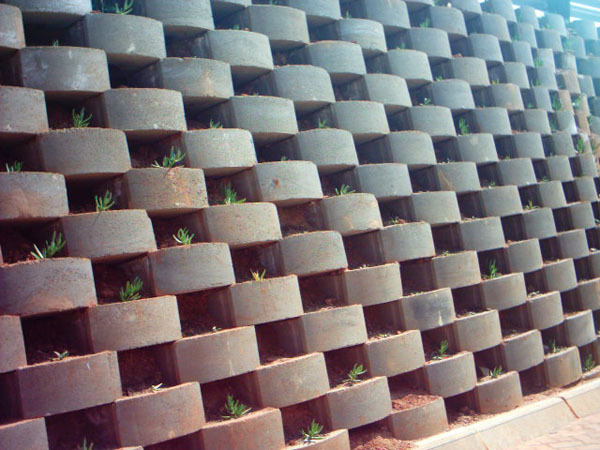 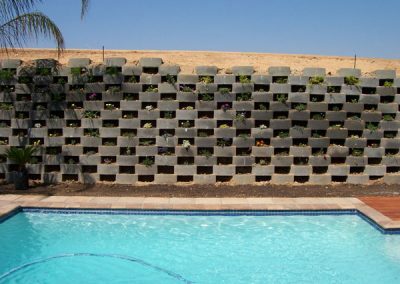 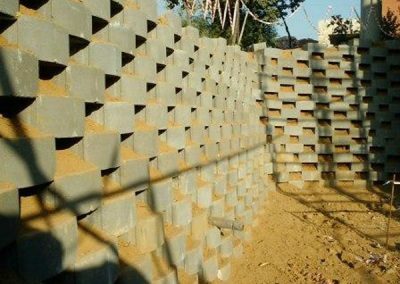 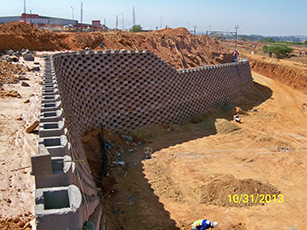 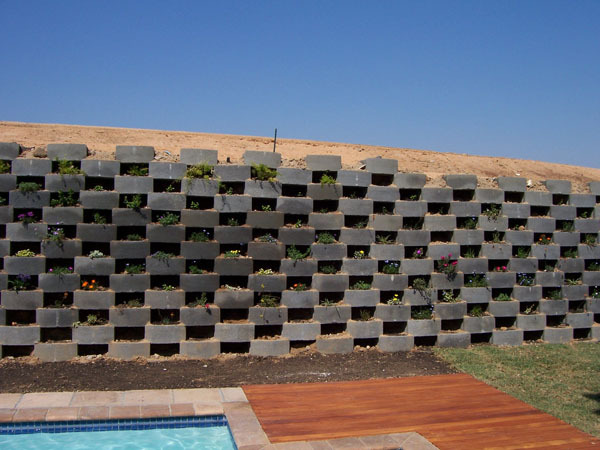 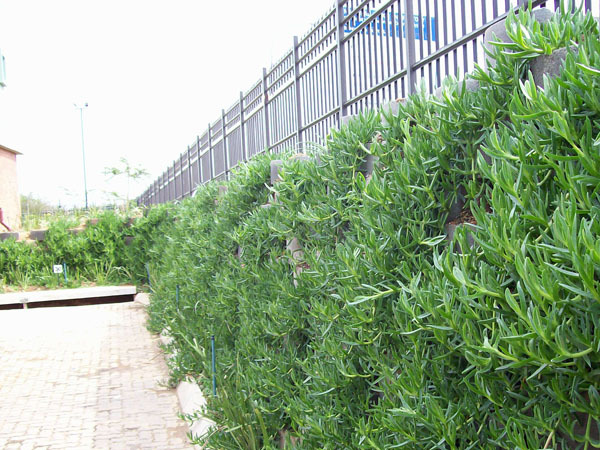 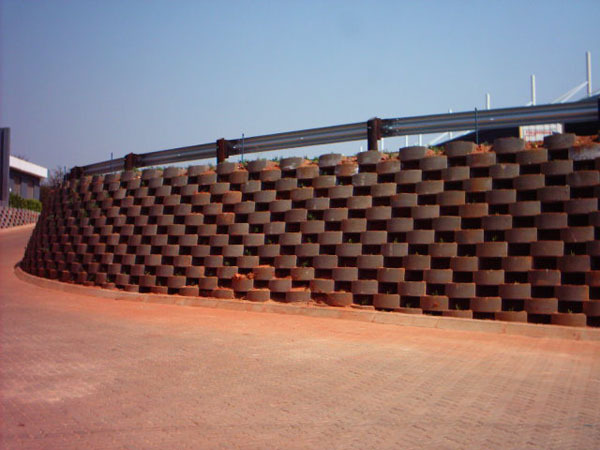 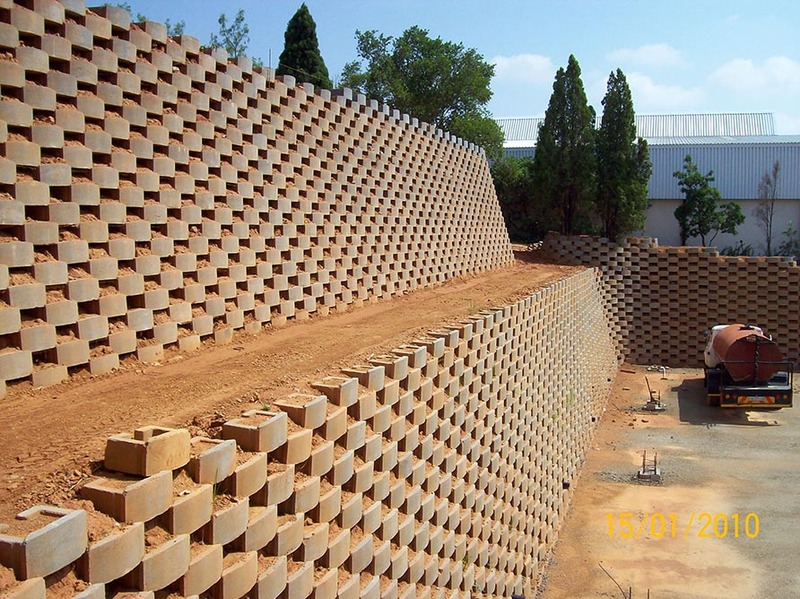 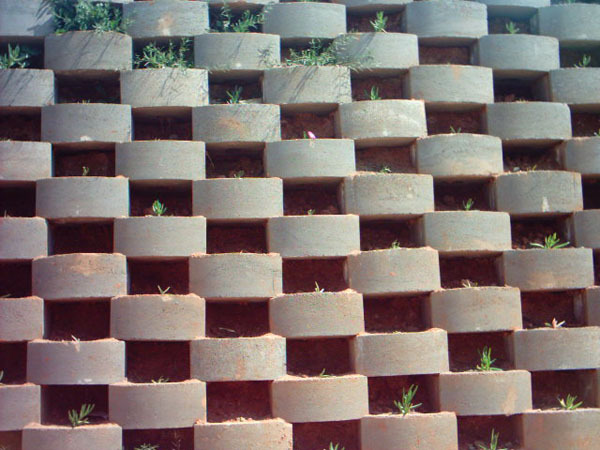 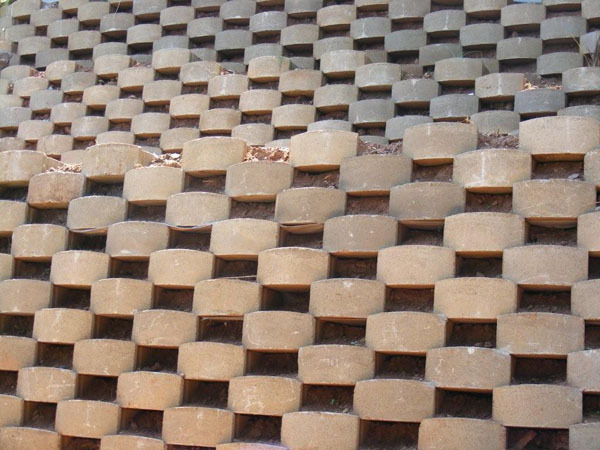 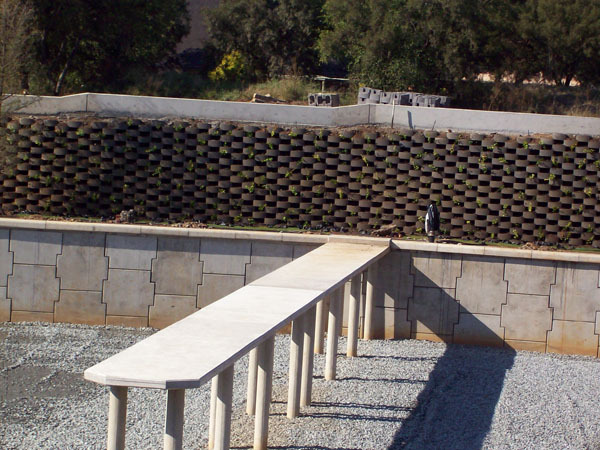 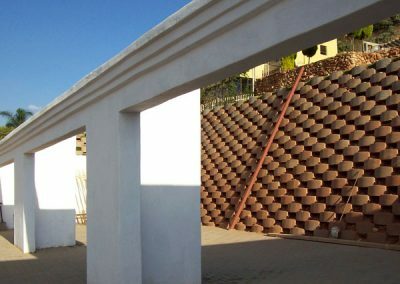 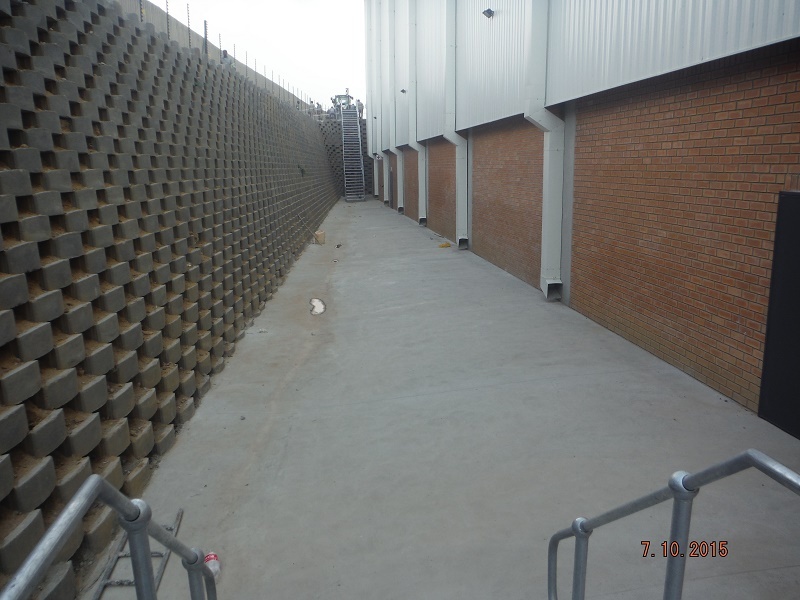 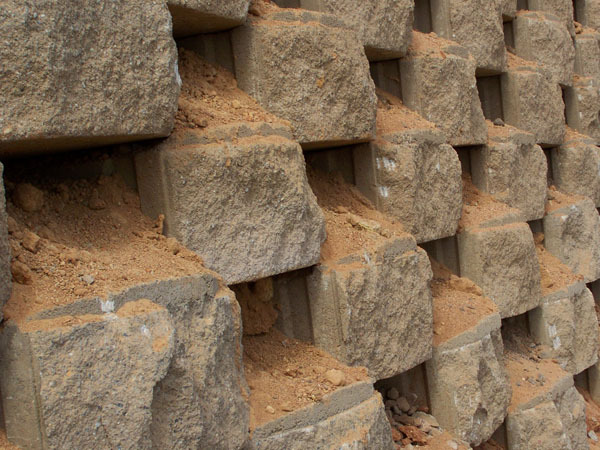 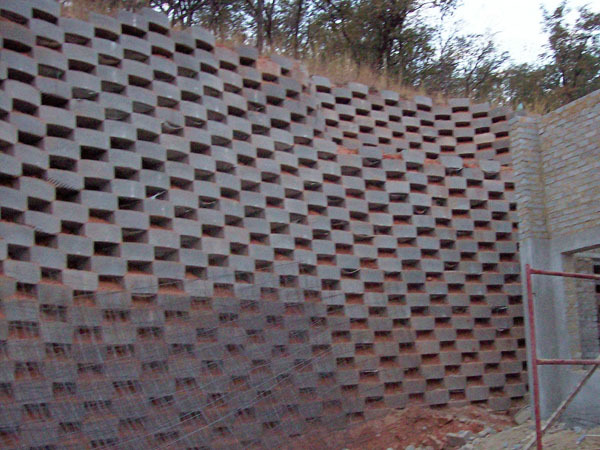 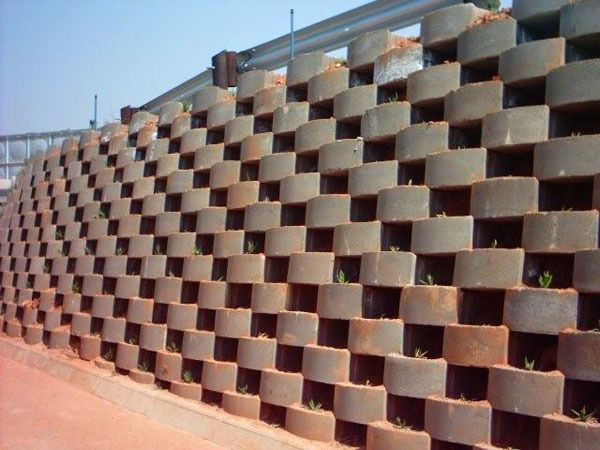 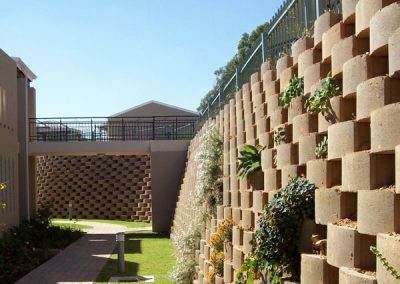 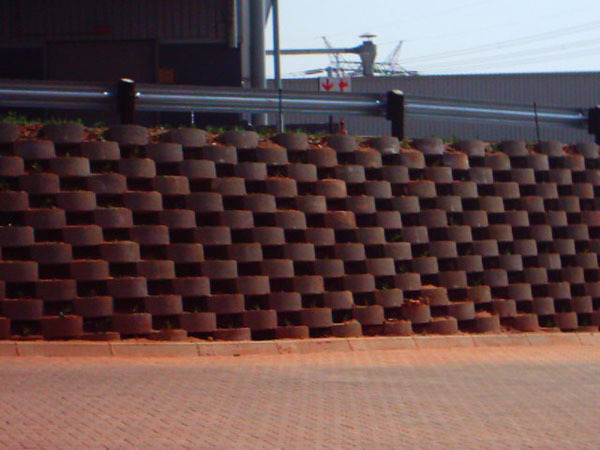 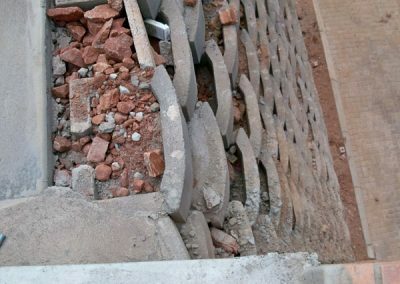 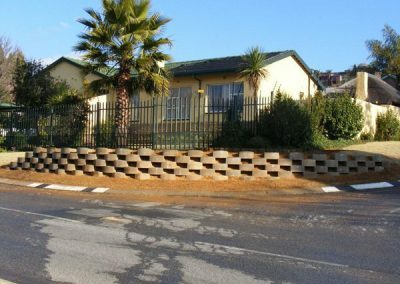 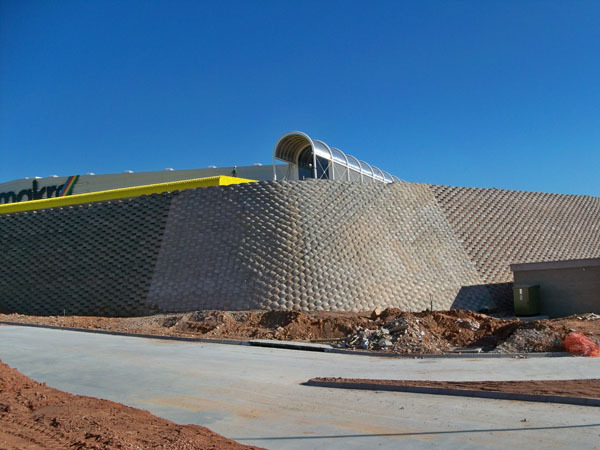 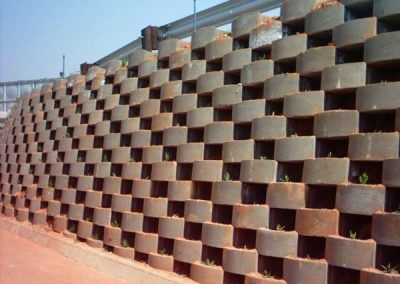 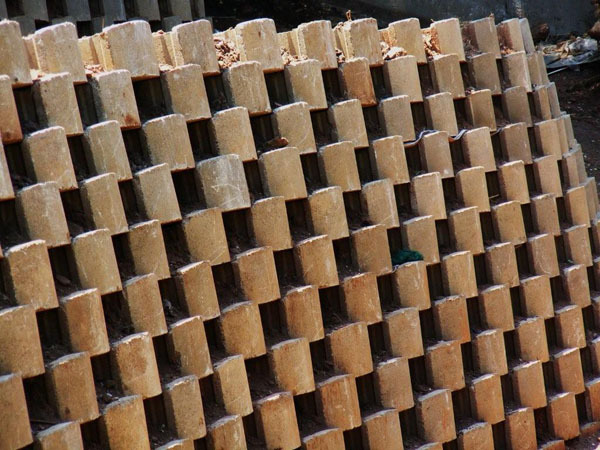 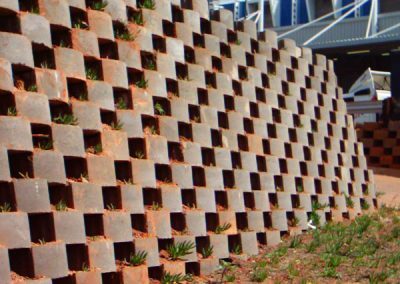 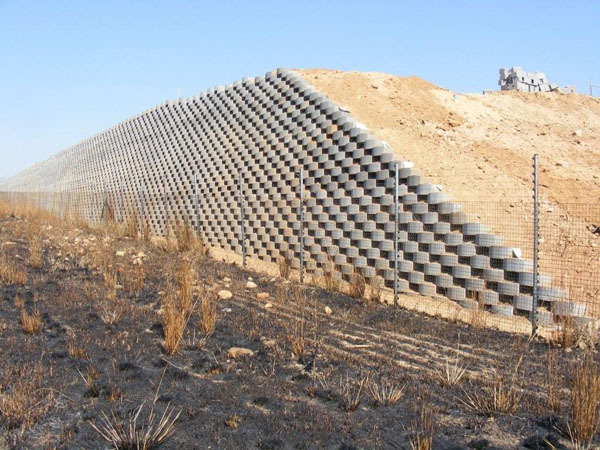 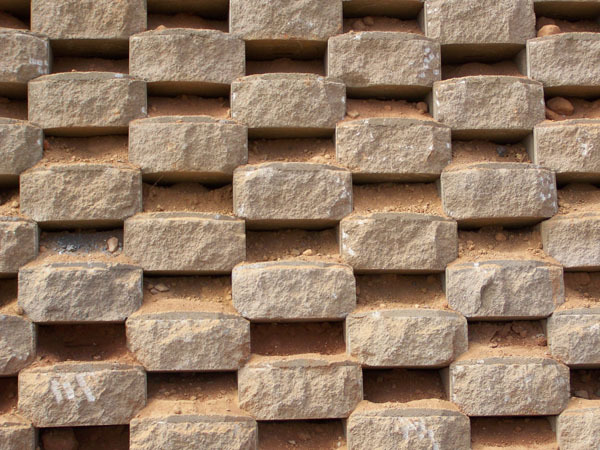 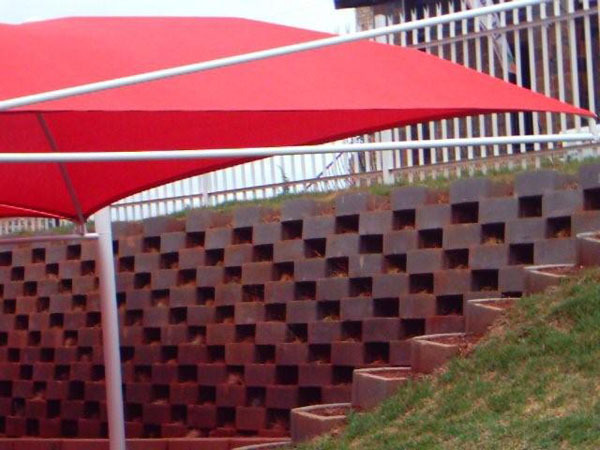 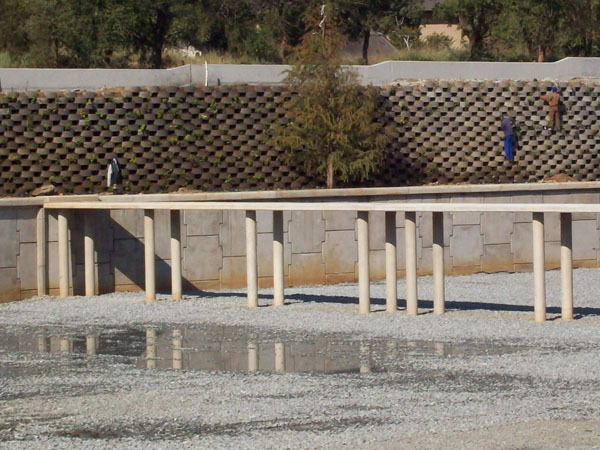 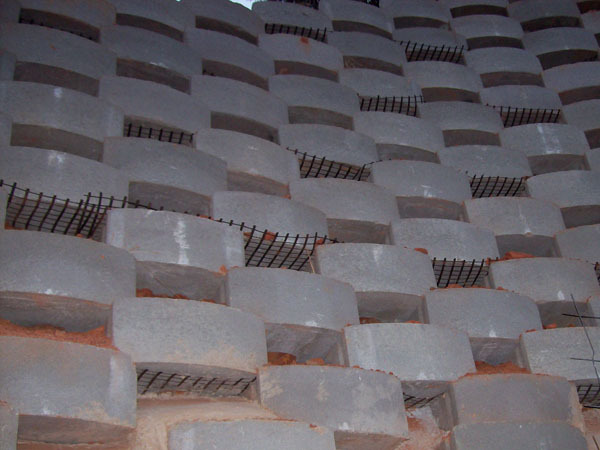 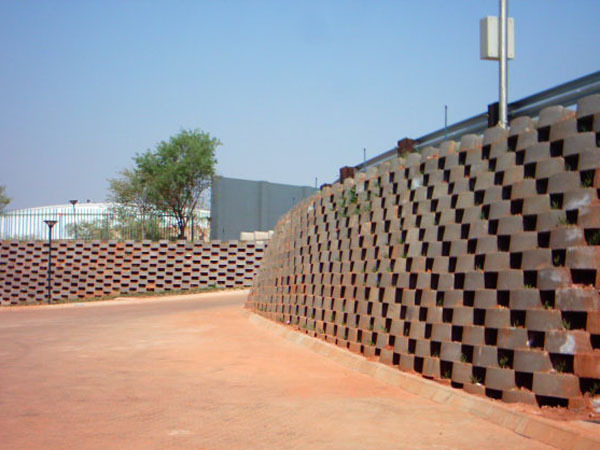 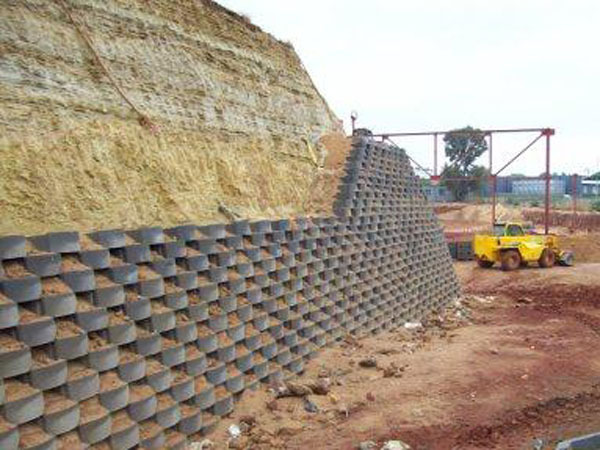 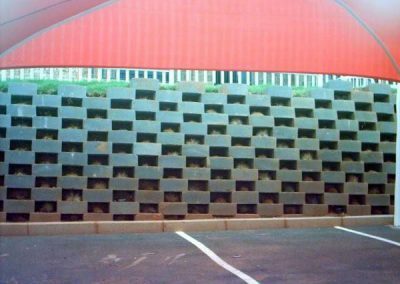 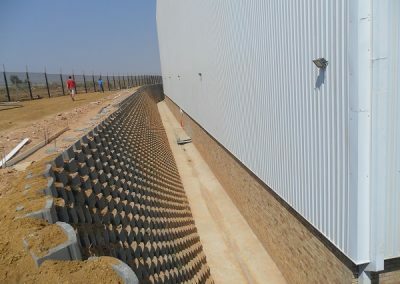 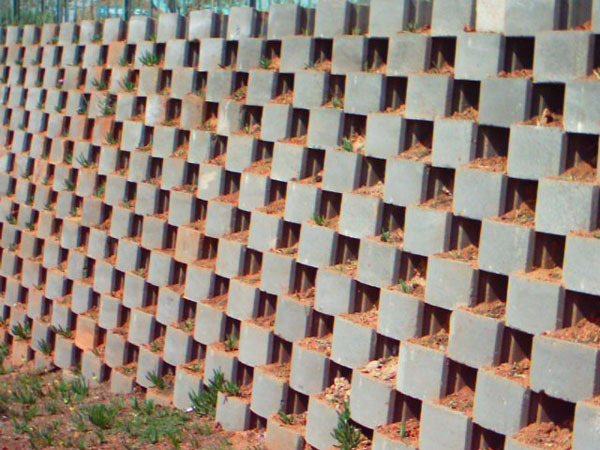 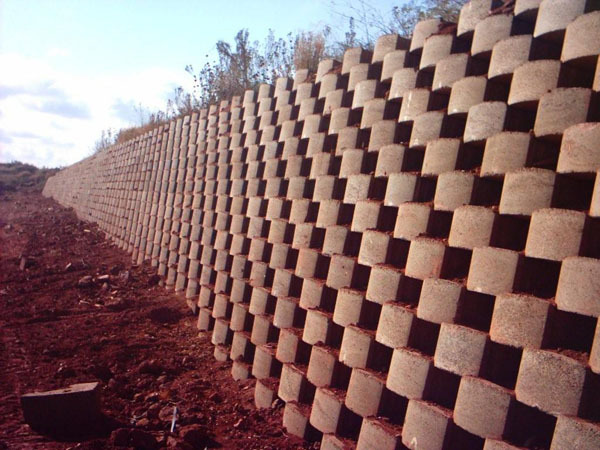 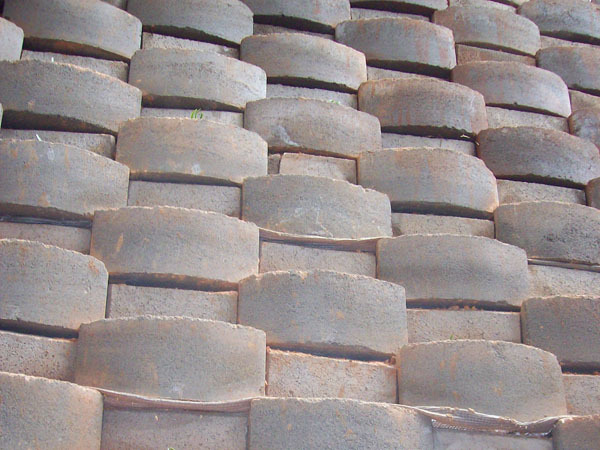 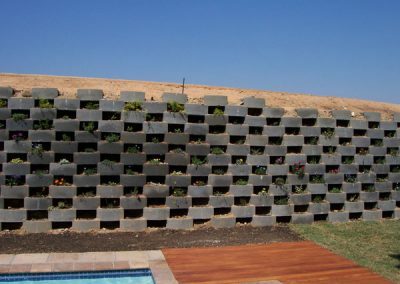 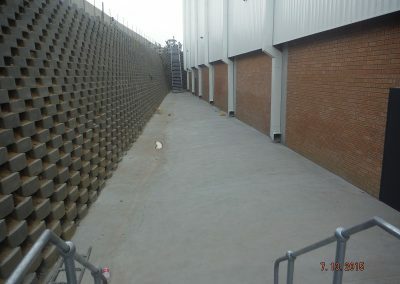 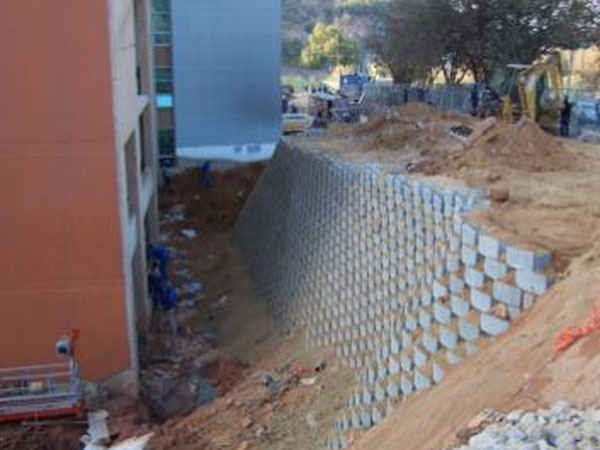 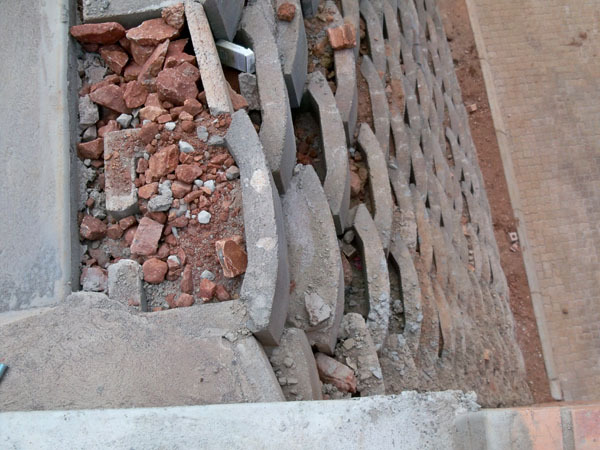 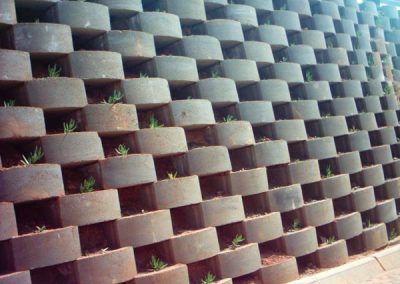 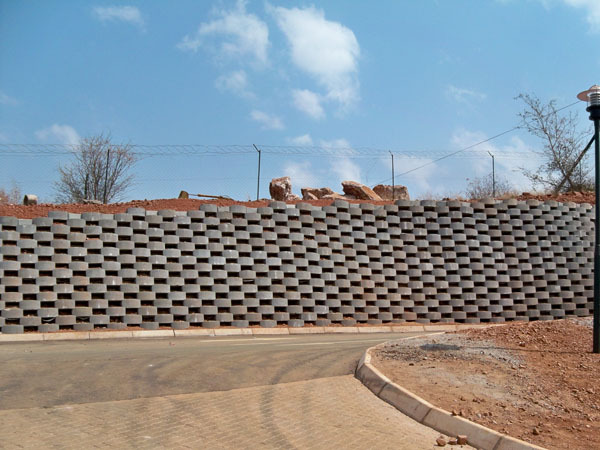 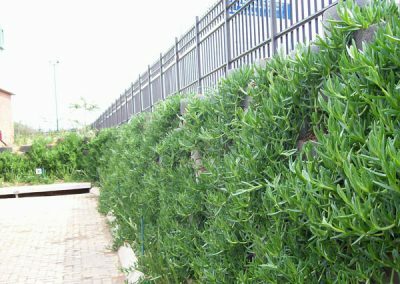 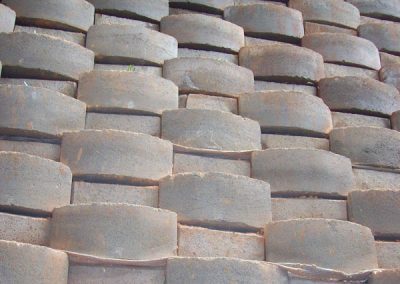 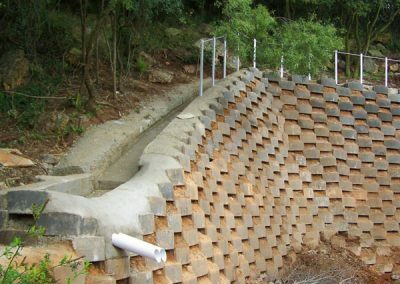 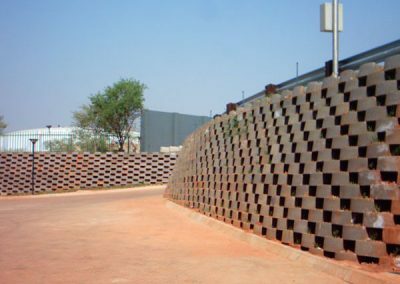 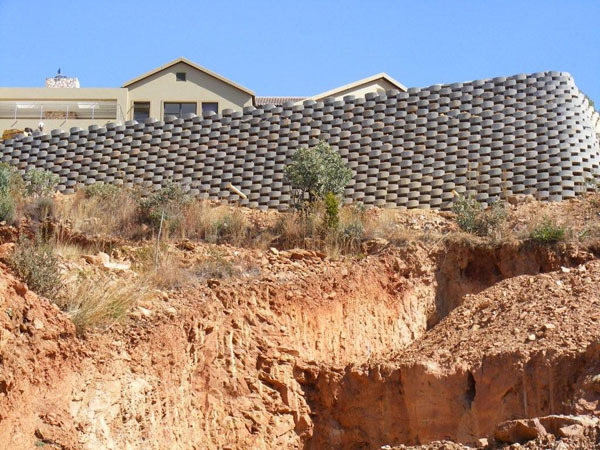 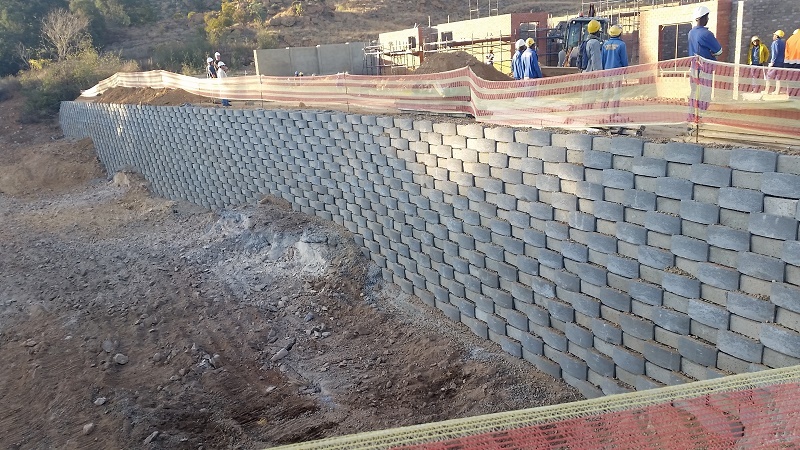 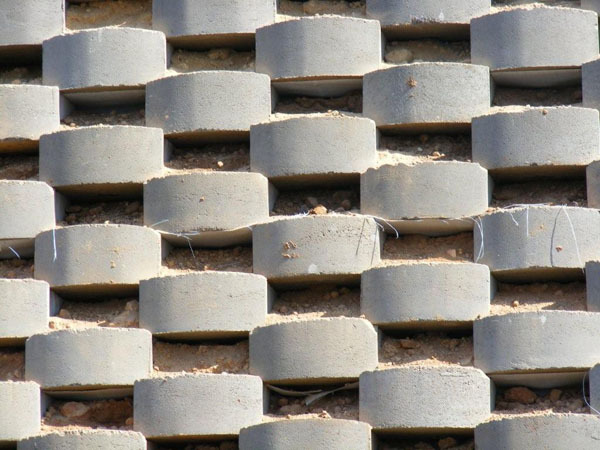 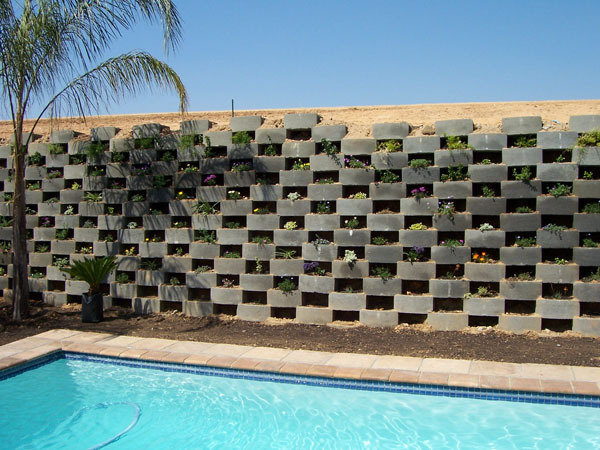 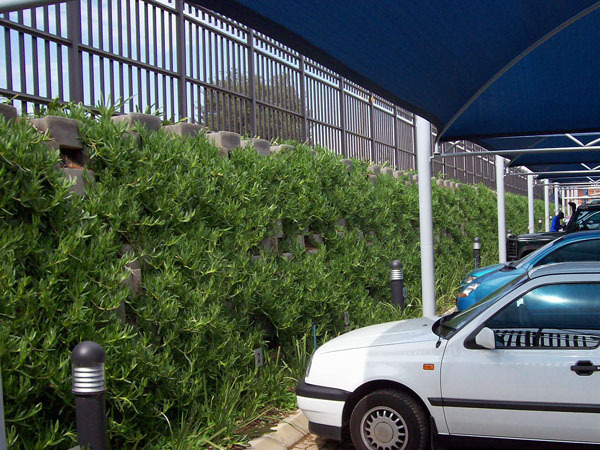 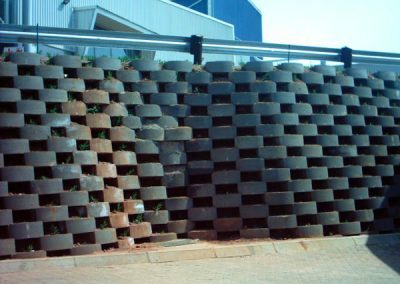 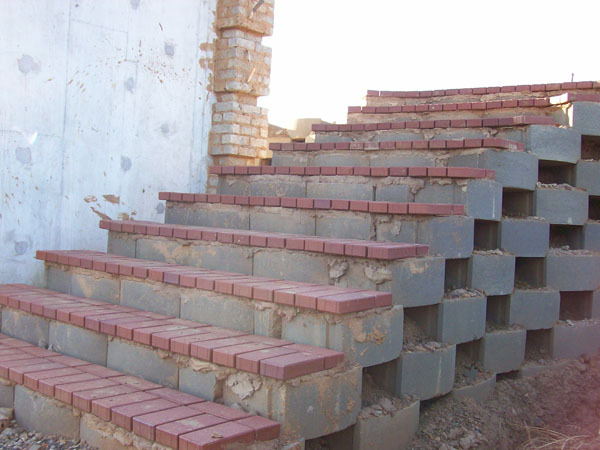 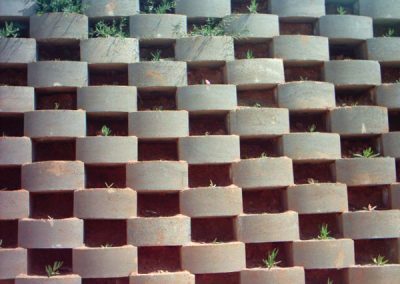 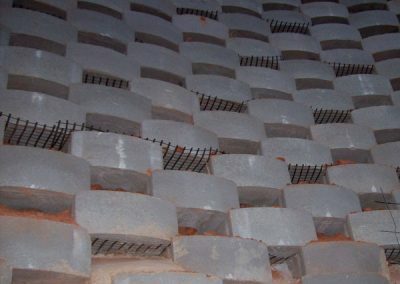 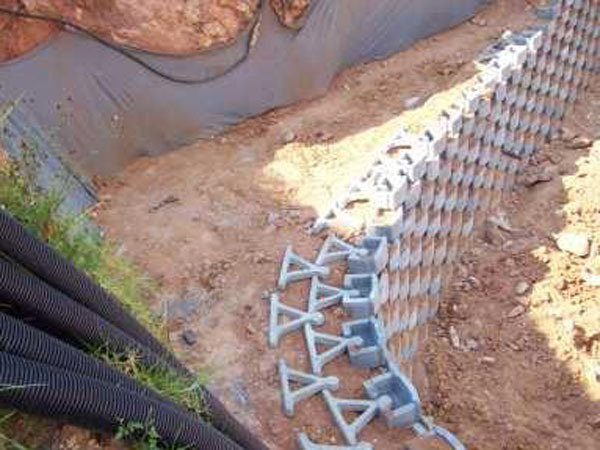 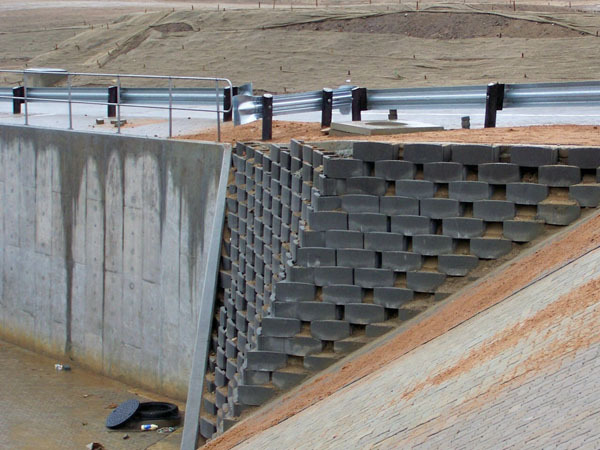 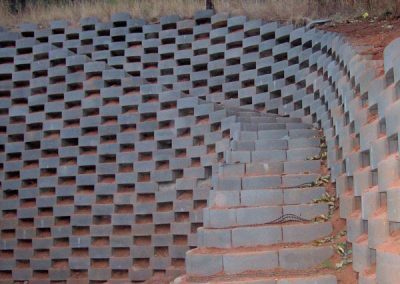 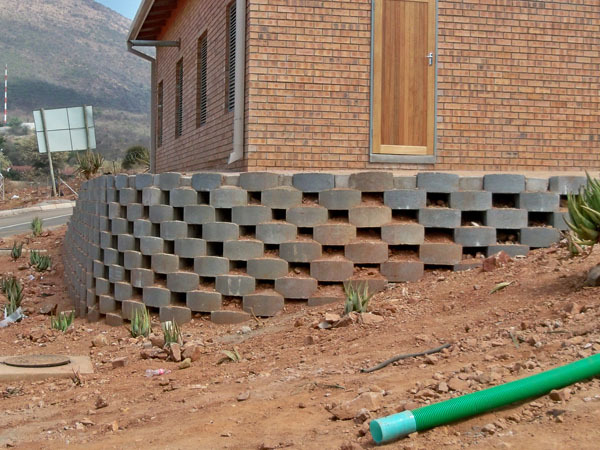 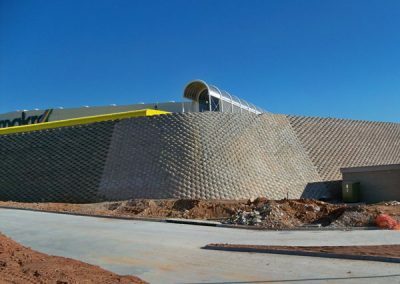 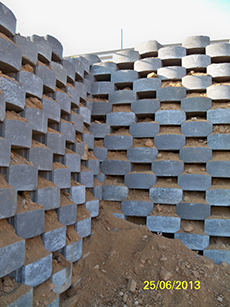 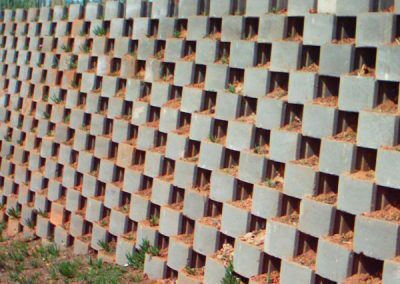 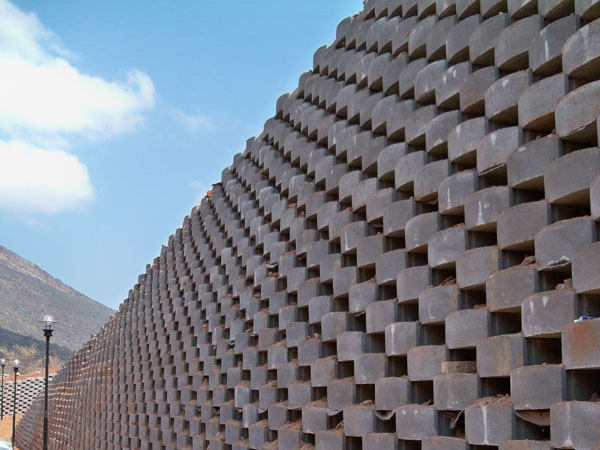 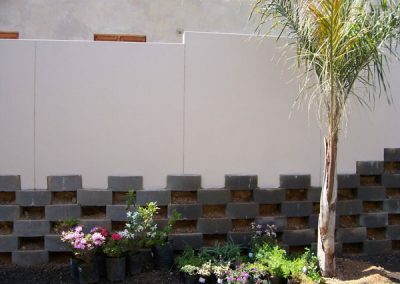 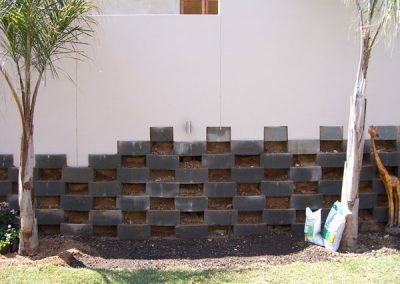 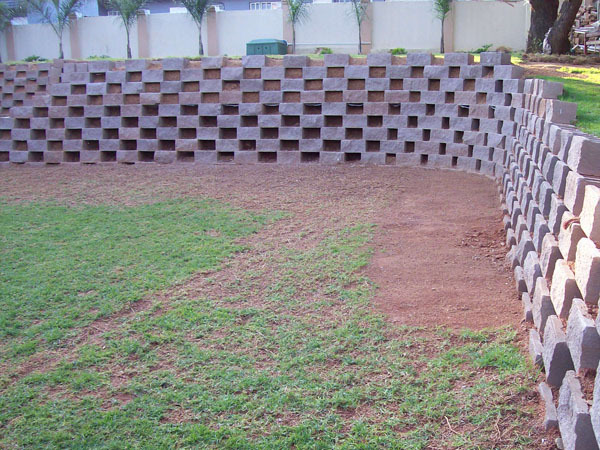 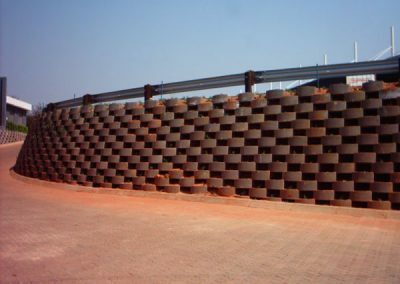 An innovative new design, ReMblok 30, not only provides much safer and more durable crb walling – for open “checker board” configurations – but is also extremely cost-competitive, with a minimum product cost saving of between 35% for a double skin (700mm deep) wall, and 52% for a full triple skin (1050mm deep) wall in Gauteng. 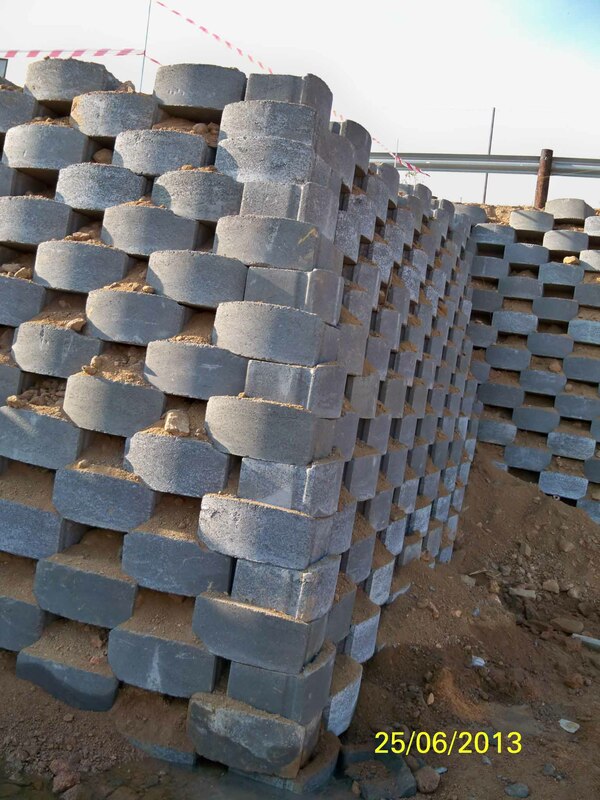 Spacing between blocks no less than 340mm. 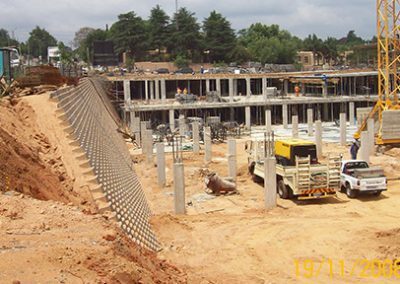 ReMblok 30 was launched in September 2005 by ReMaCon Products, a company which was founded to manufacture and market the new crb system. 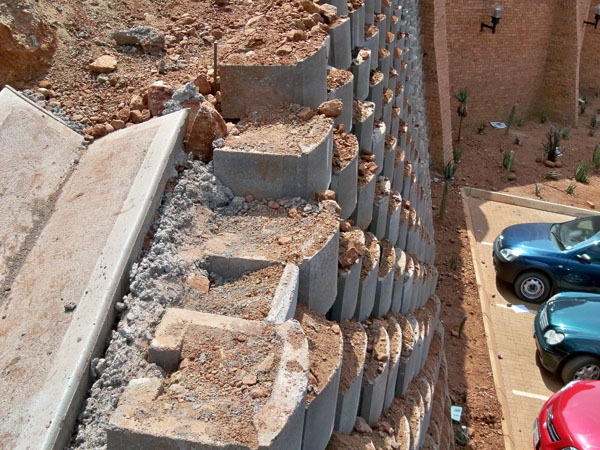 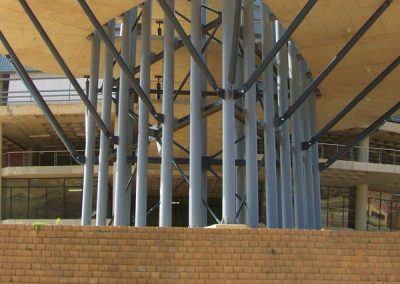 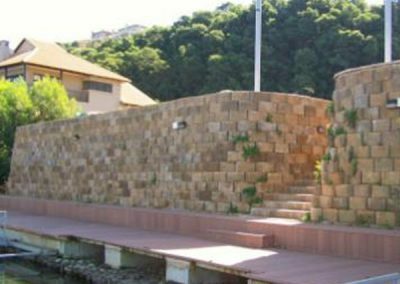 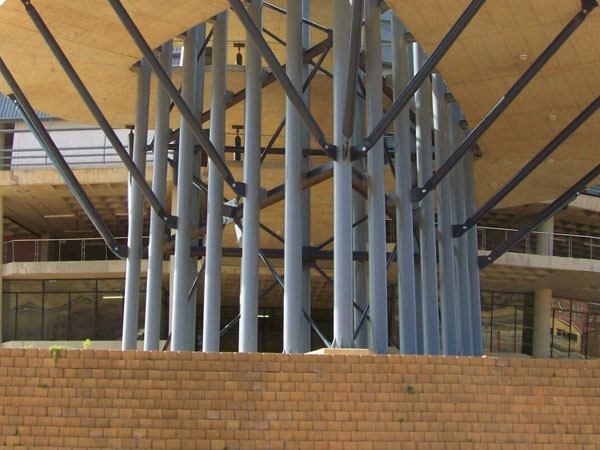 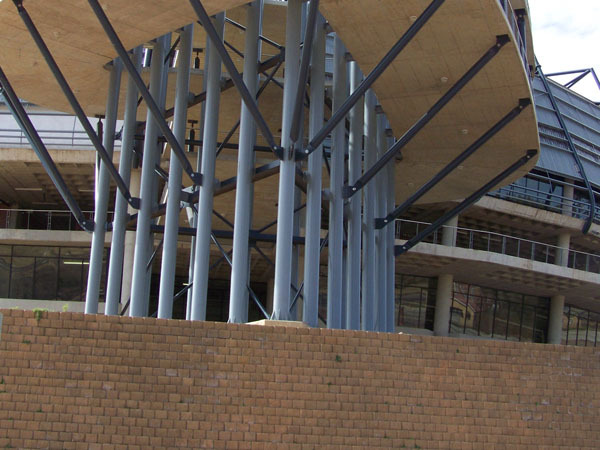 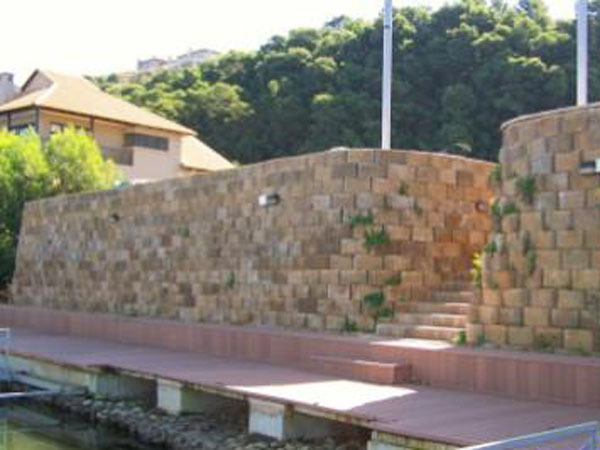 Unlike current “GRAVITY” crb walls which are stabilized through the use of “double” skin and/or “triple” skin combinations for mass and depth, ReMblok 30 is based on a reinforced concrete interlocking mechanism which enhances stability considerably. 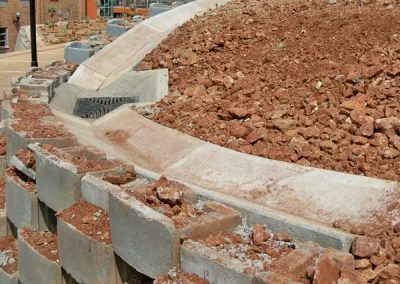 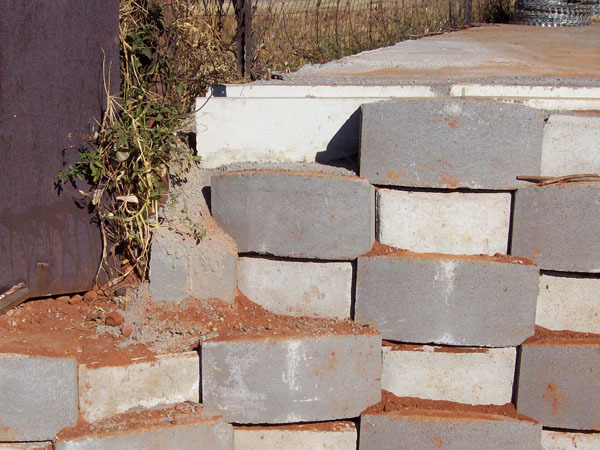 Incorporating a simple reinforced concrete tie-back with a head that locks positively into a primary facing block, the system obviates the sole reliance on friction and its attendant risk of slippage and/or fabric shear. 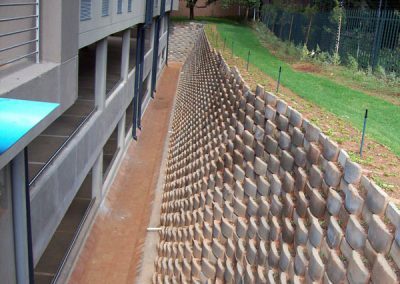 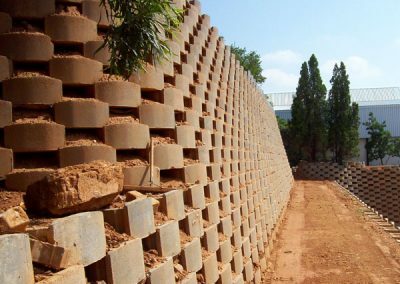 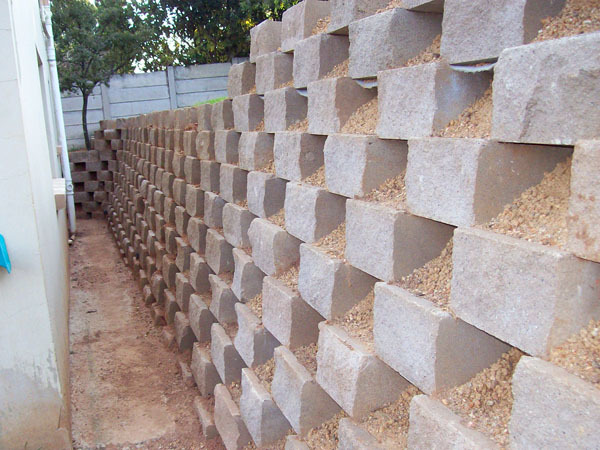 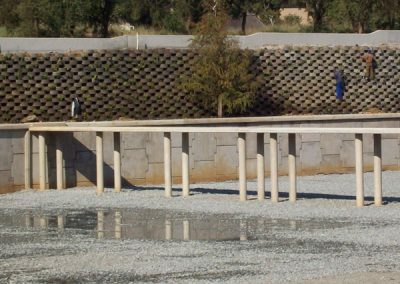 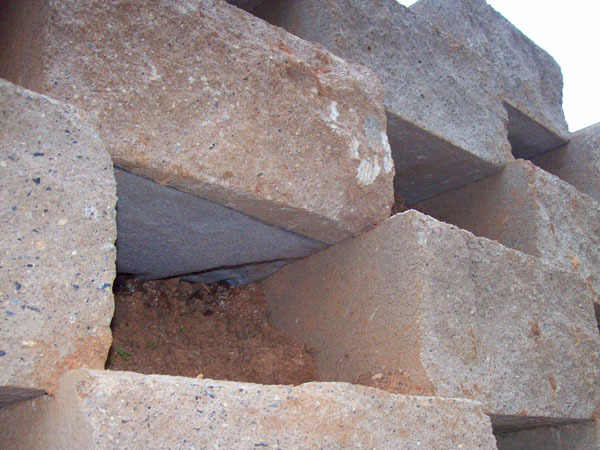 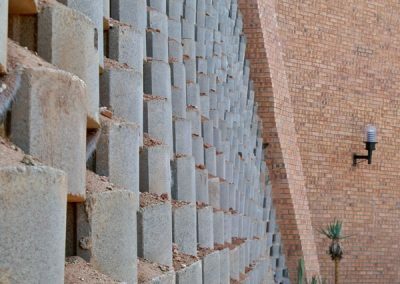 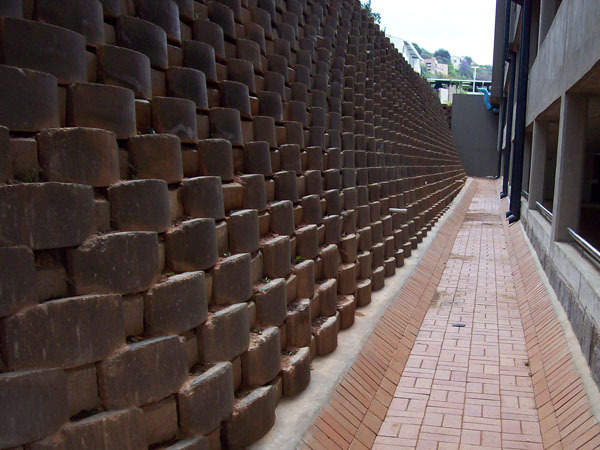 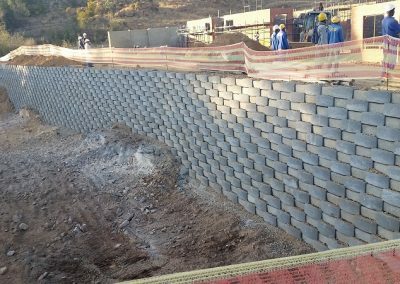 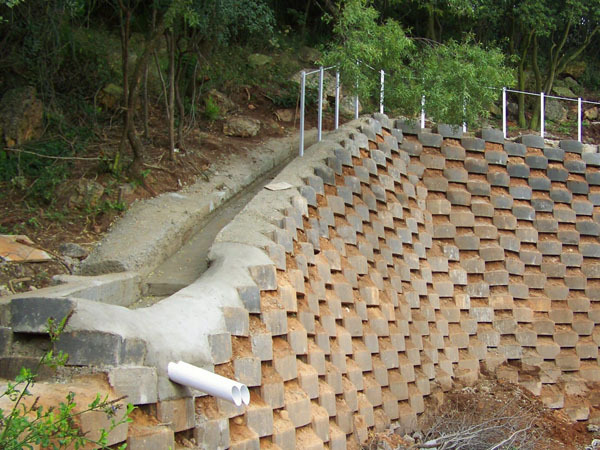 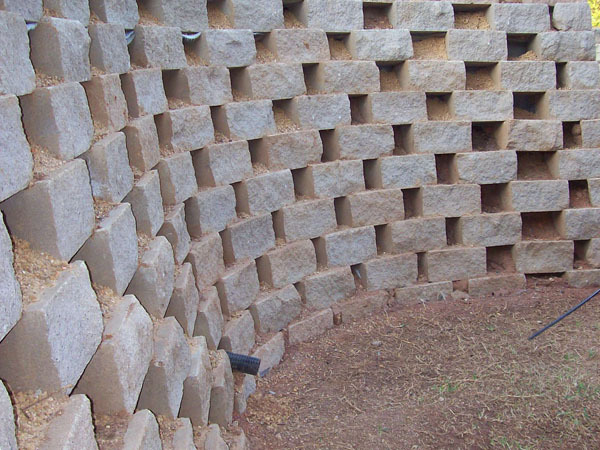 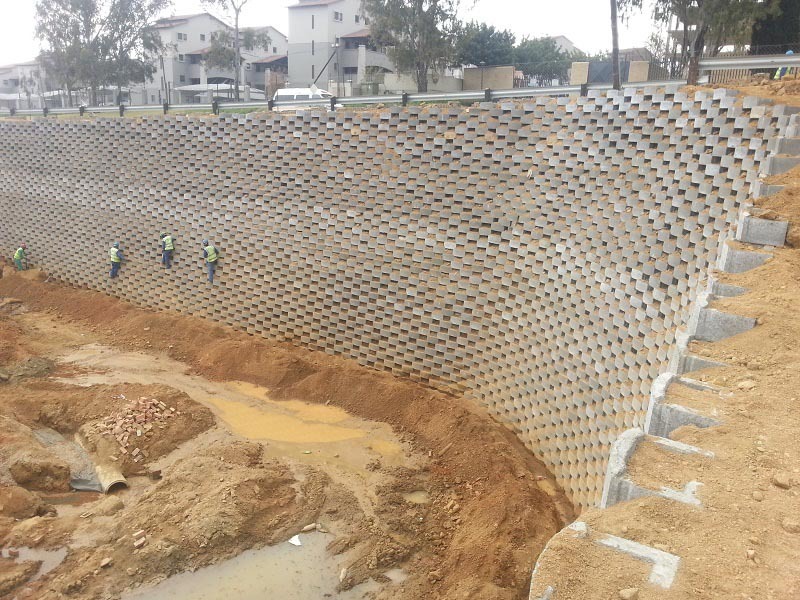 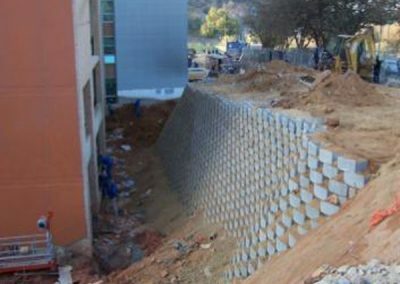 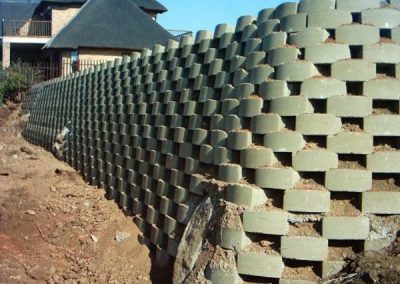 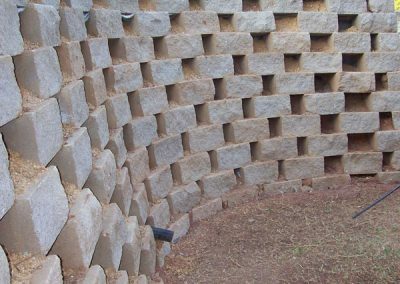 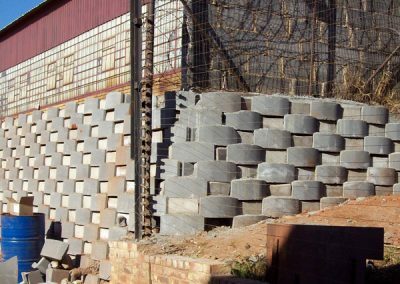 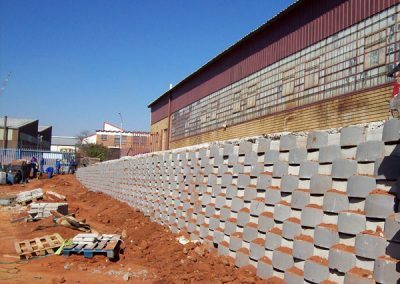 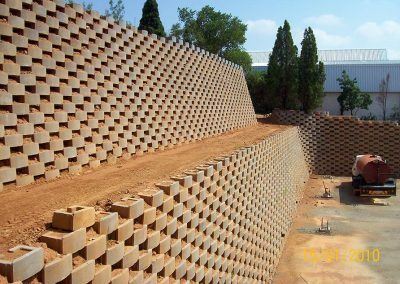 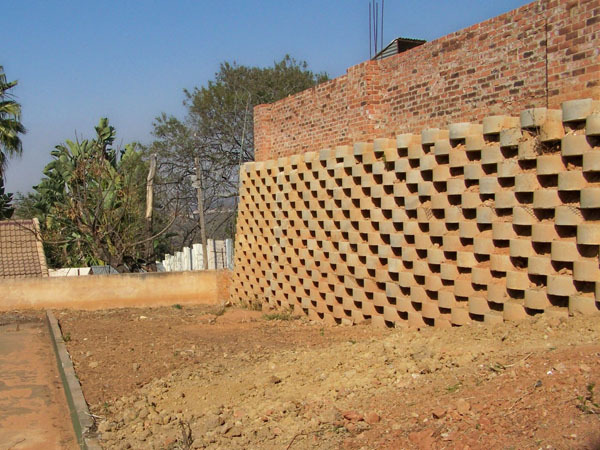 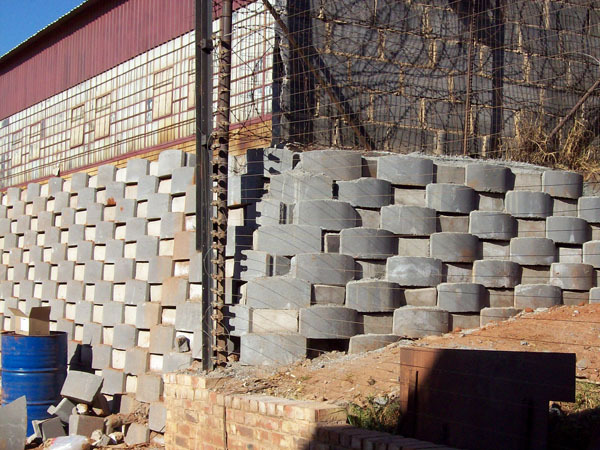 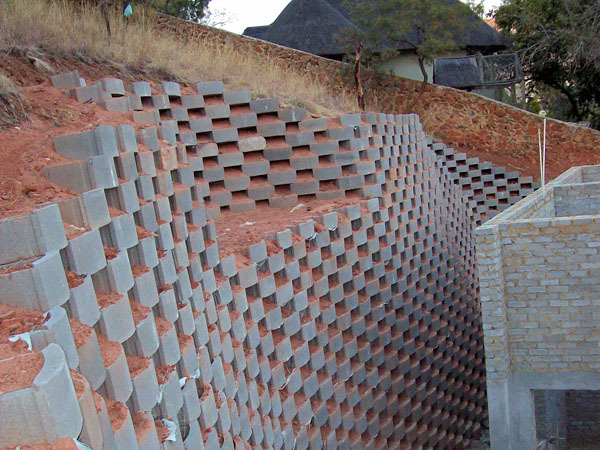 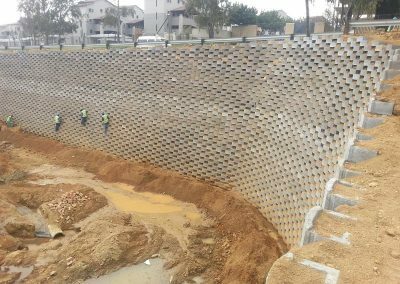 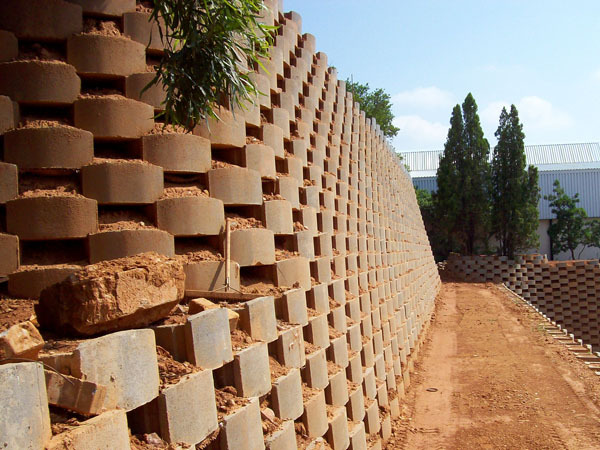 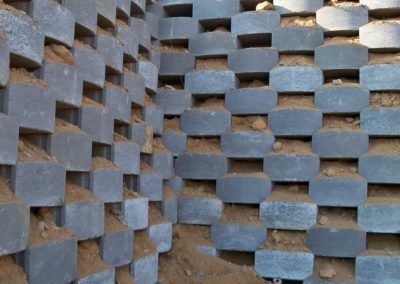 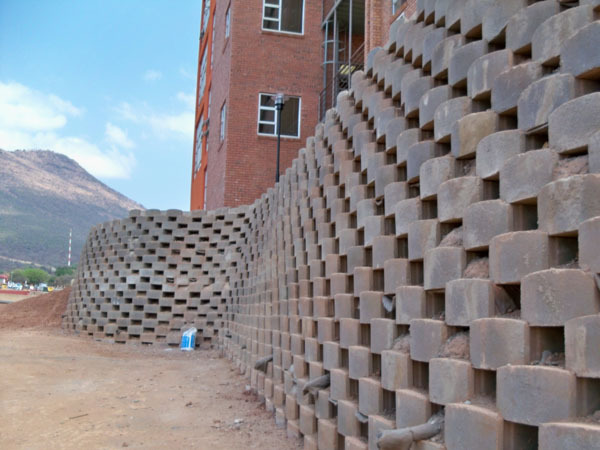 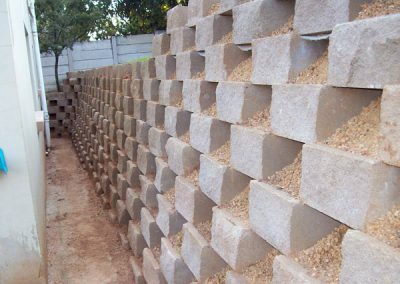 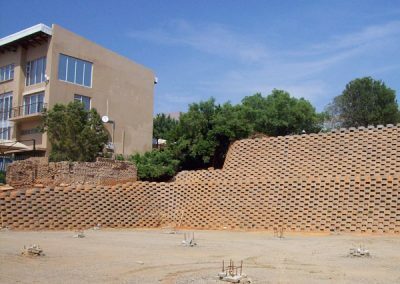 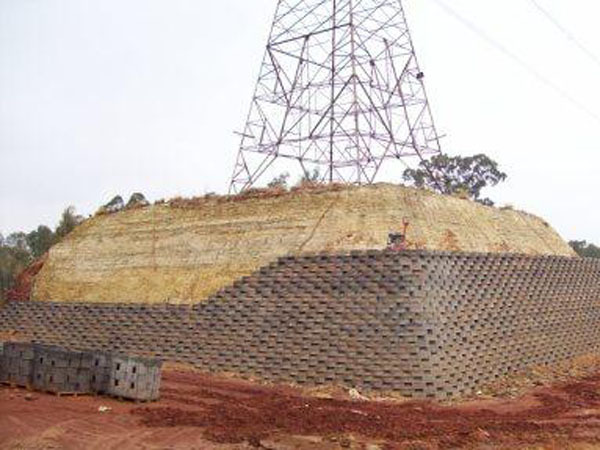 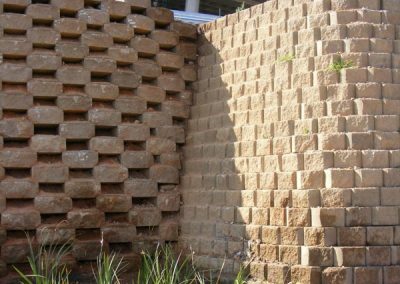 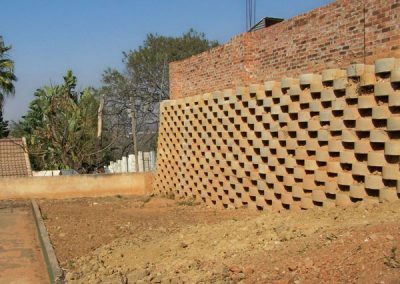 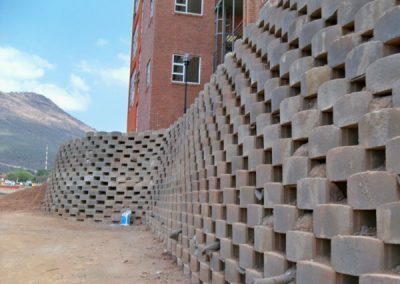 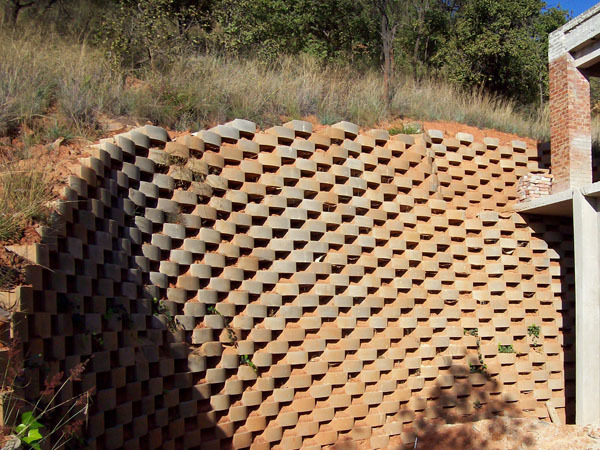 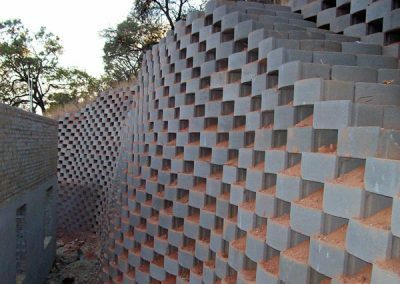 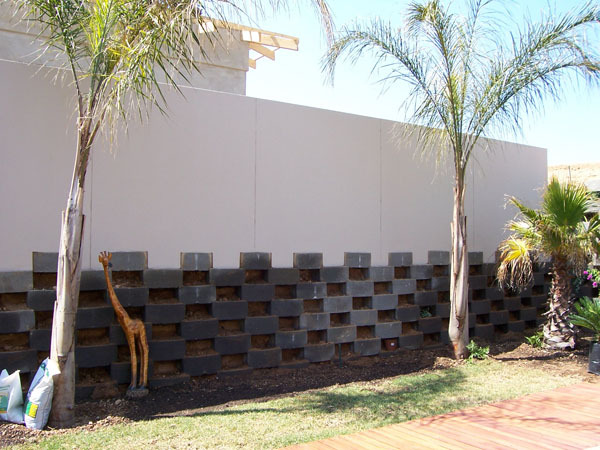 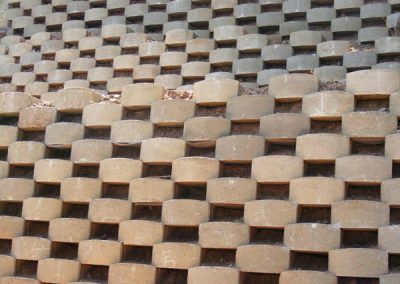 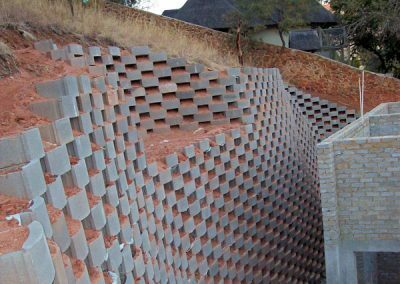 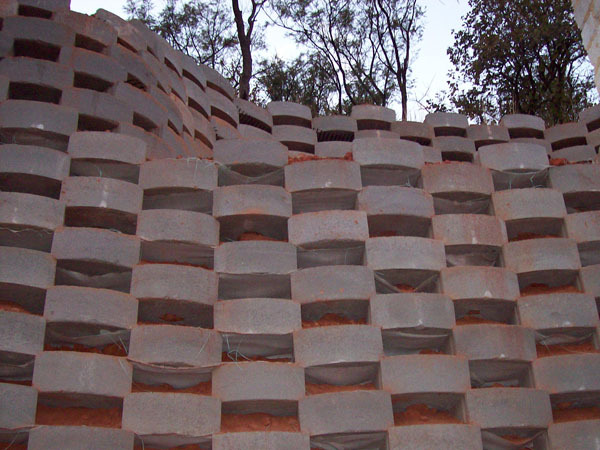 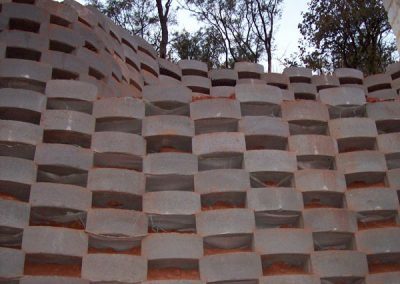 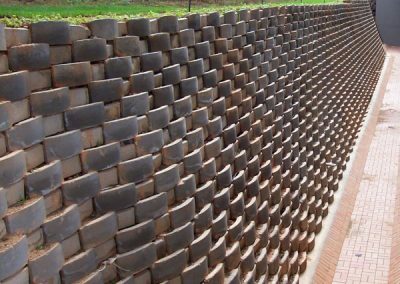 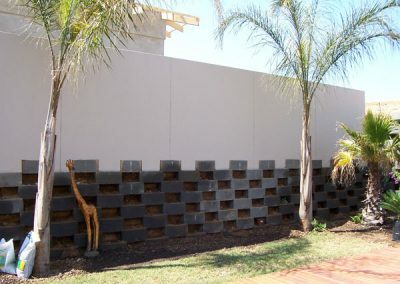 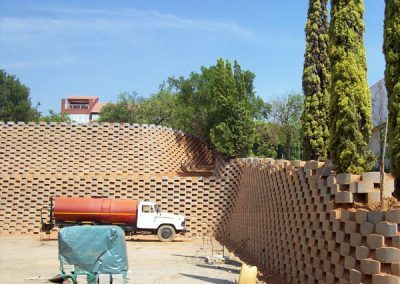 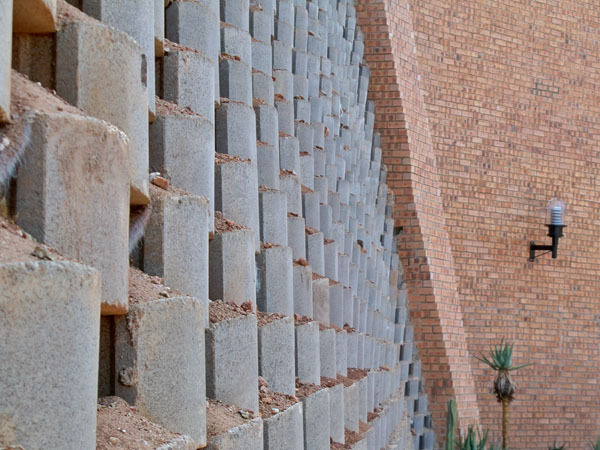 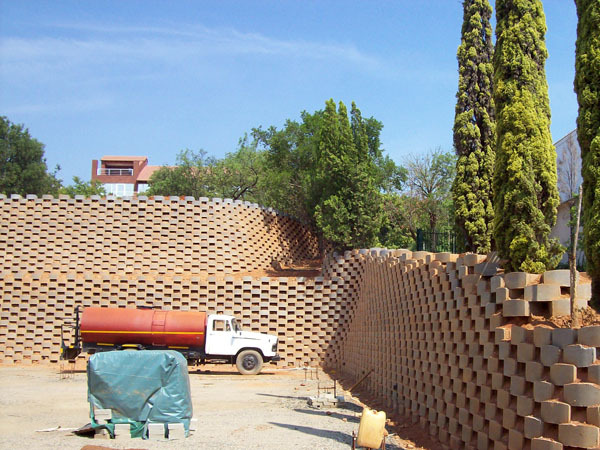 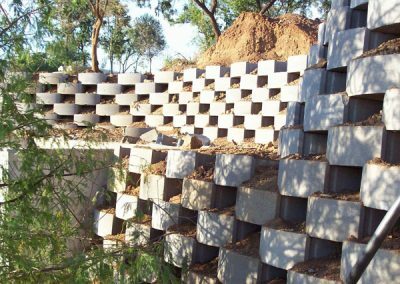 The proportion of block mass to anchorage depth (with or without geo-fabrics) in ReMblok 30 offers design engineers greater design versatility for both mass gravity or fabric reinforced walls. 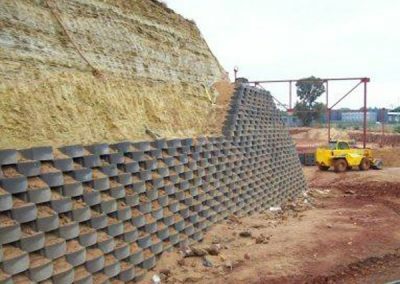 “The extension element allows vibrating rollers to achieve higher compacting than in traditional crb systems and reduces the risk of blocks sliding forward during compacting. 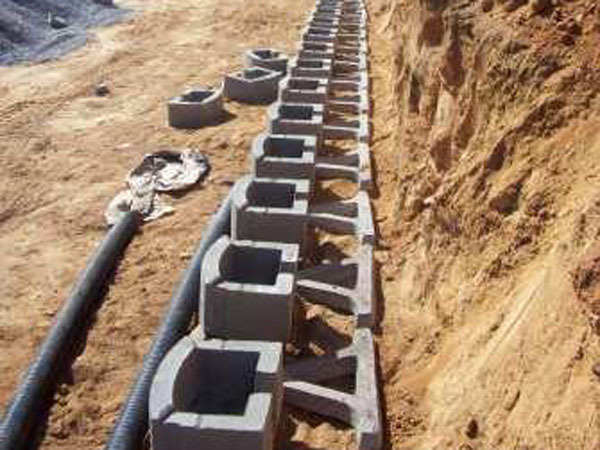 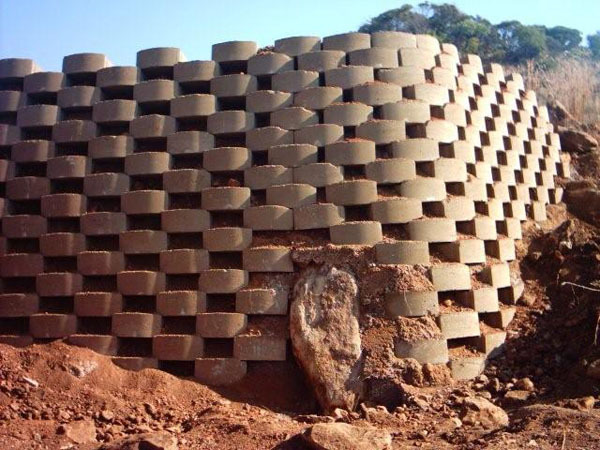 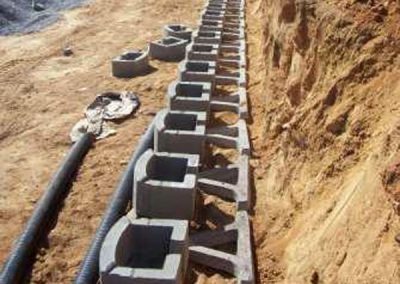 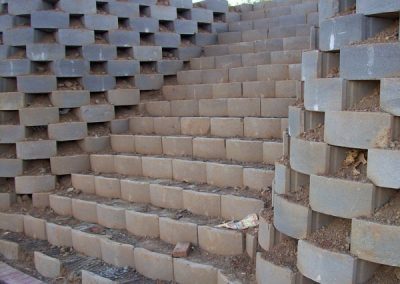 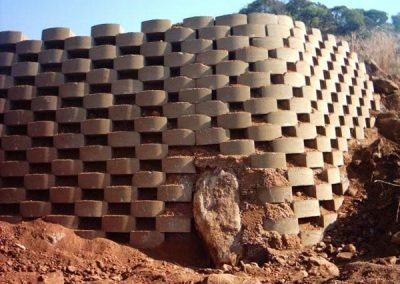 This is due to the fact that the soil which is filled into the cavities created by the extension pieces can be compacted, thereby creating friction columns. 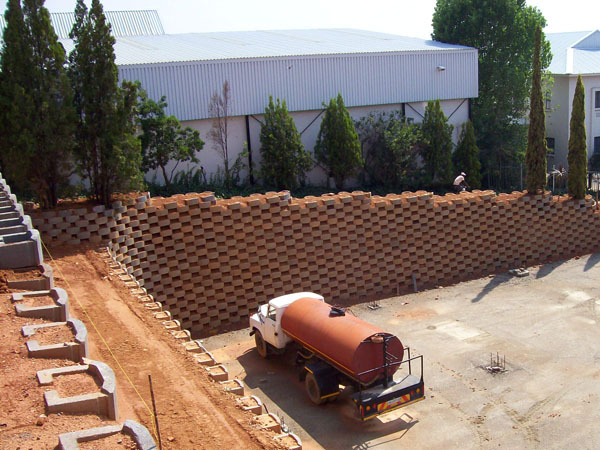 “Although labour intensive and job-creation friendly, the cost of the ReMblok 30 system is low, due to lower production and maintenance costs, the latter arising from enhanced durability. 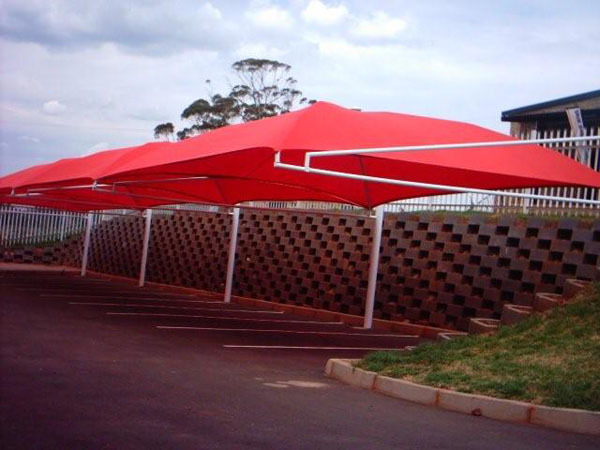 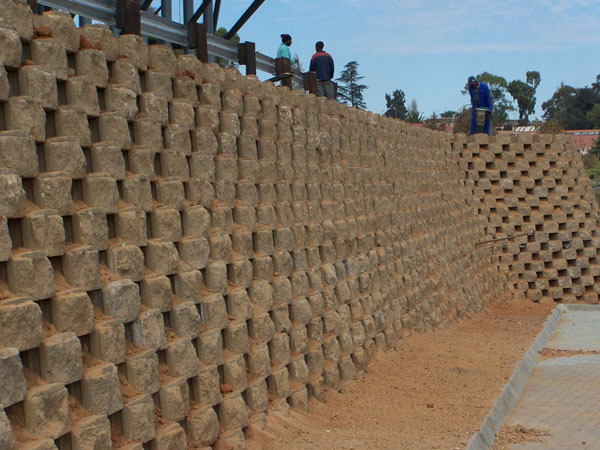 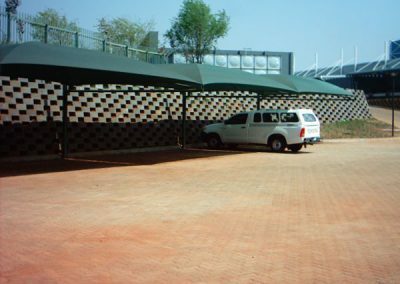 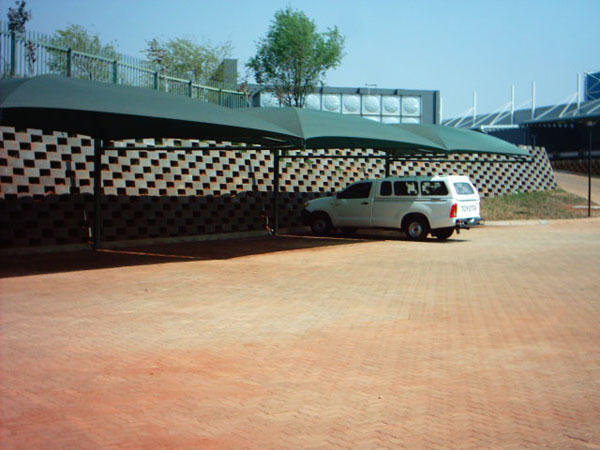 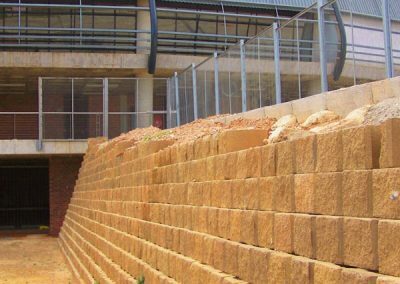 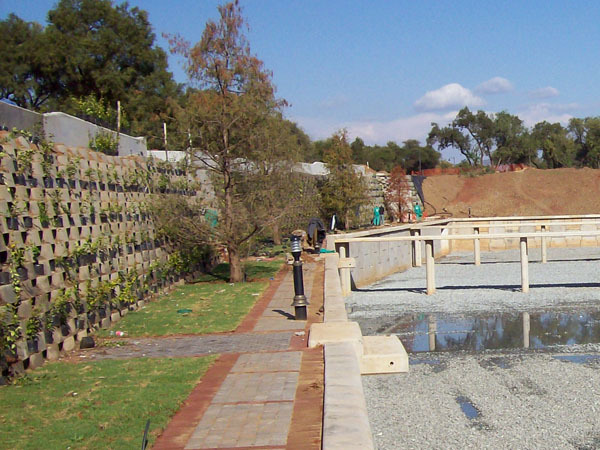 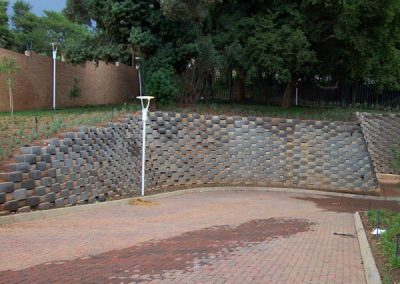 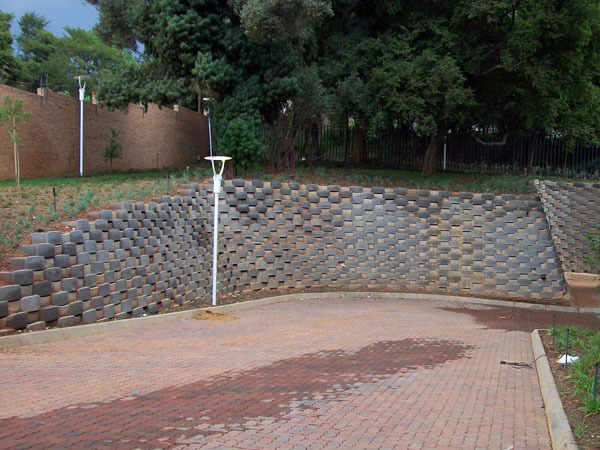 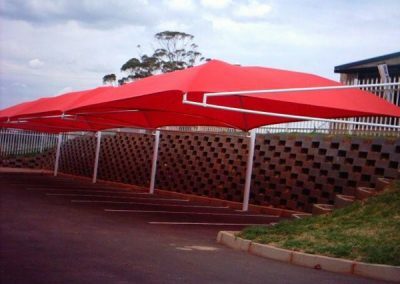 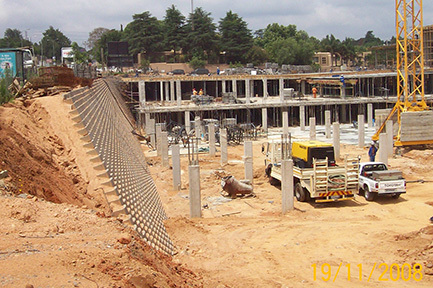 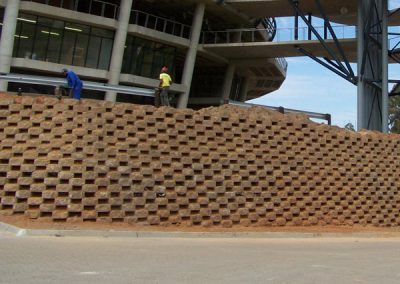 A qualified civil engineering technician (T4 Civil) with an IMM, Ferraris has been involved in the construction industry since 1987, first with Grinaker Precast (now INFRASET) and then Echo Floors as sales and marketing manager and as general manager of Smartstone Midrand. 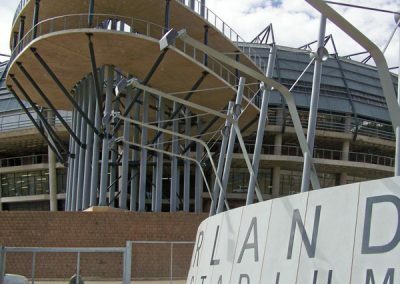 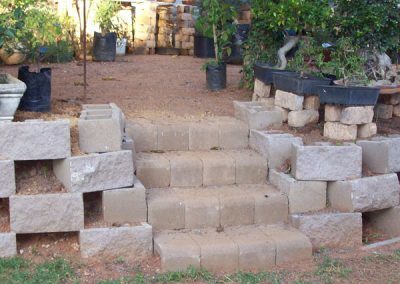 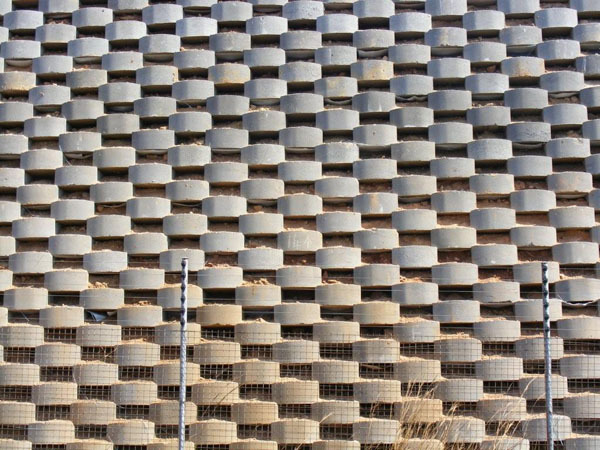 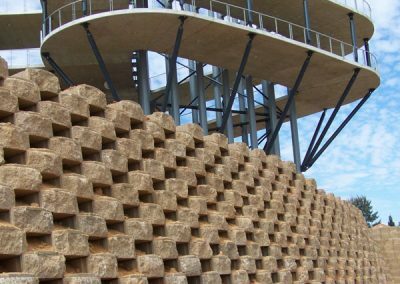 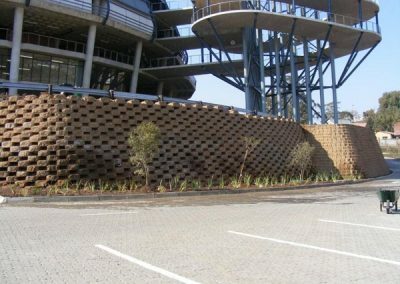 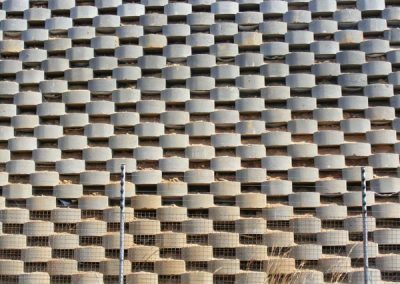 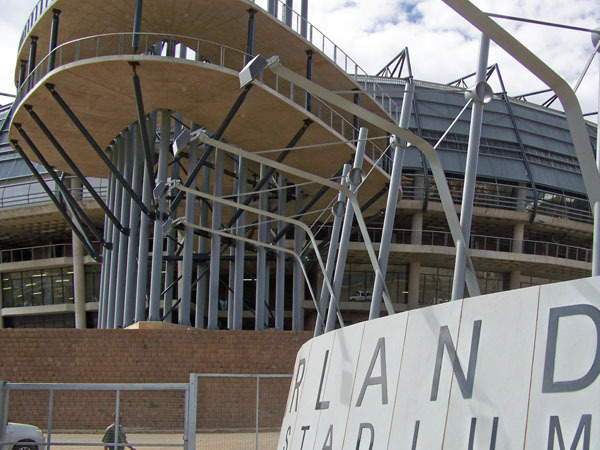 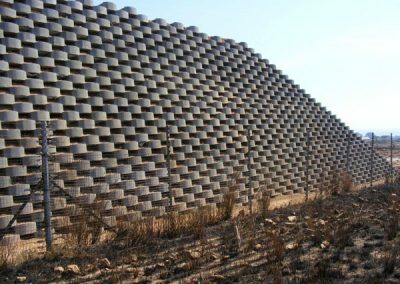 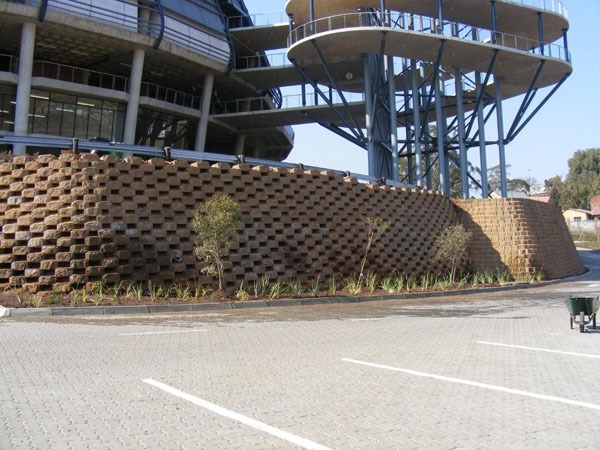 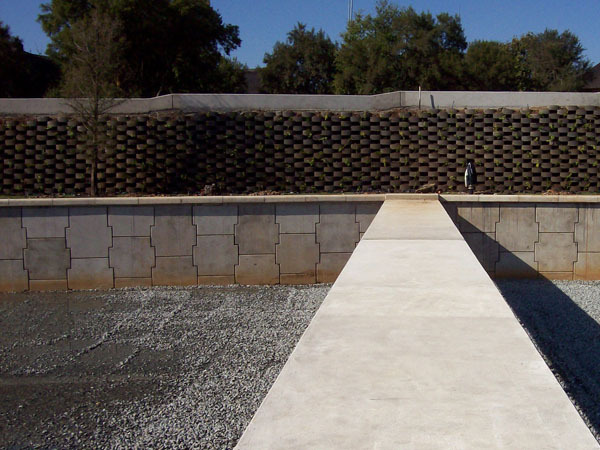 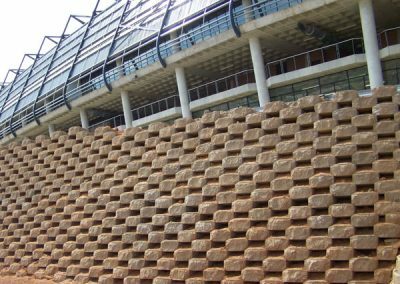 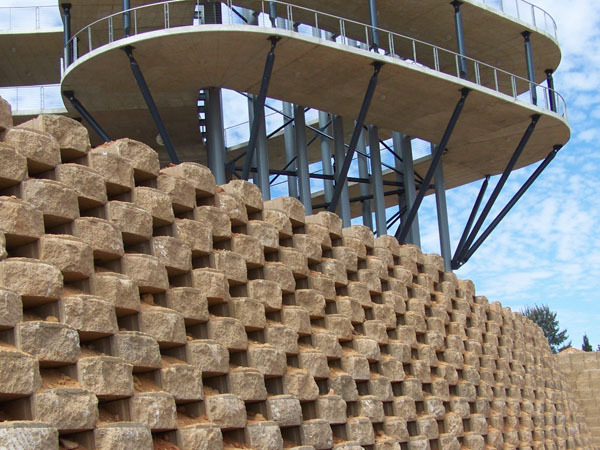 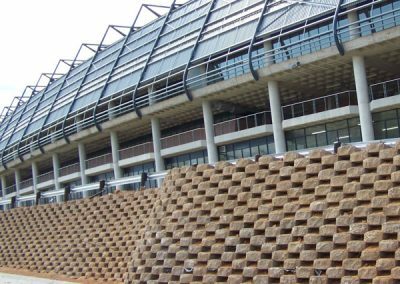 At Grinaker Precast he was responsible for the intellectual property of the company’s products, including retaining blocks and stadium seating. 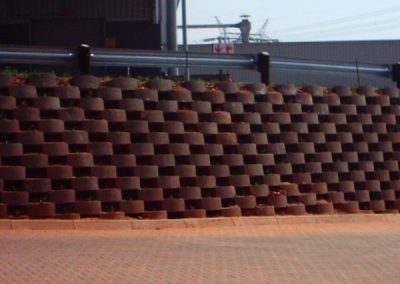 Ferraris has a long association with the Concrete Manufacturers Association (CMA) where he has held the positions of vice president for both the paving and the crb divisions. 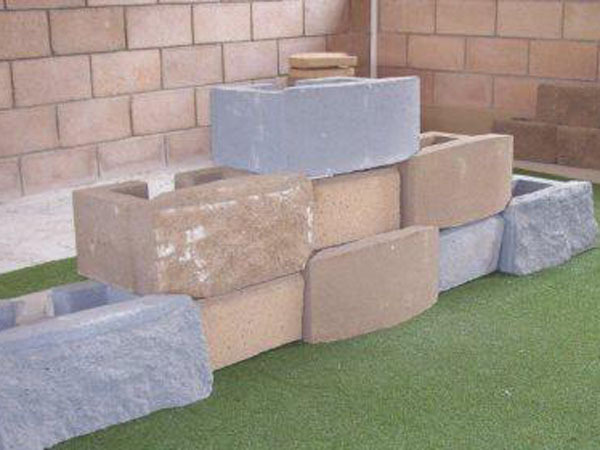 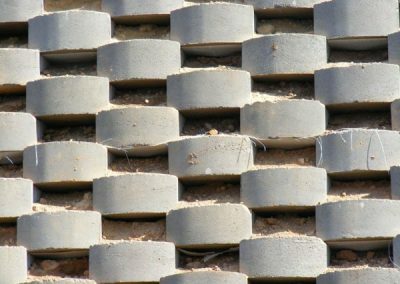 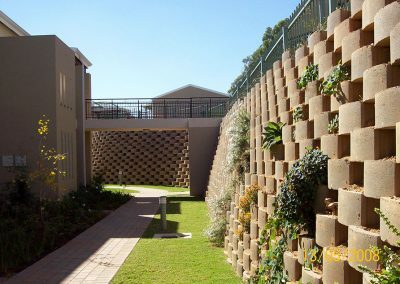 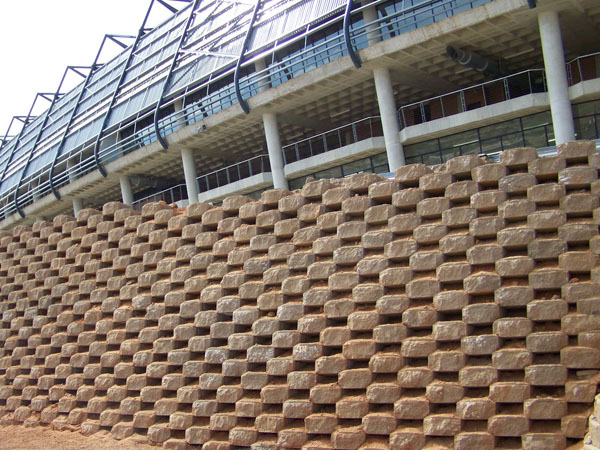 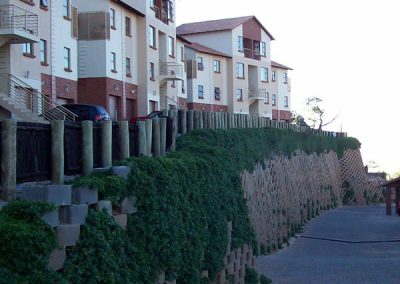 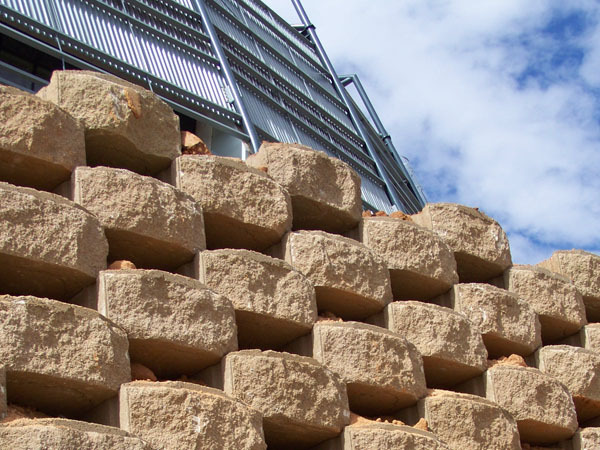 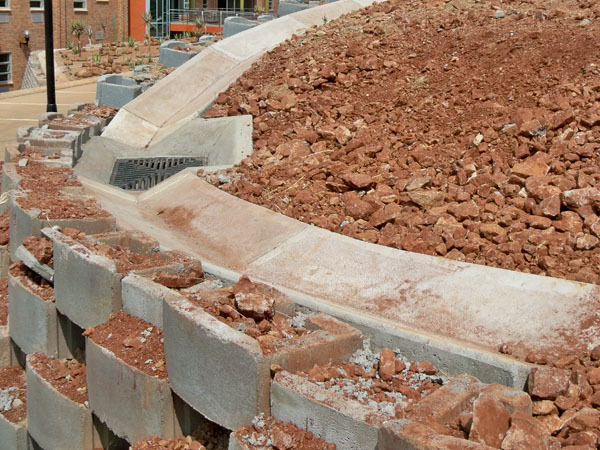 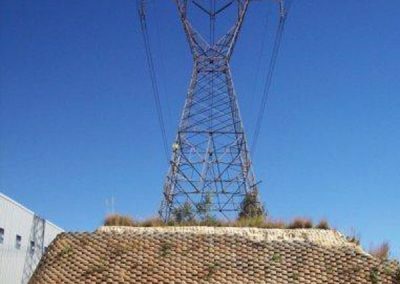 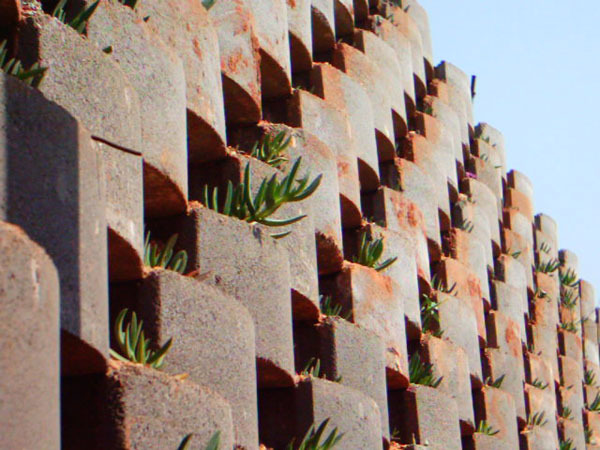 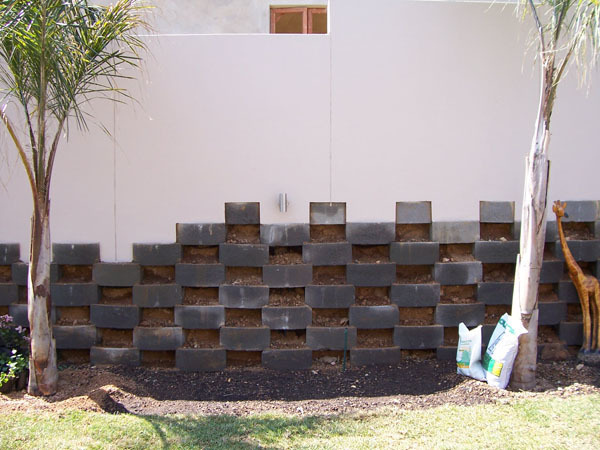 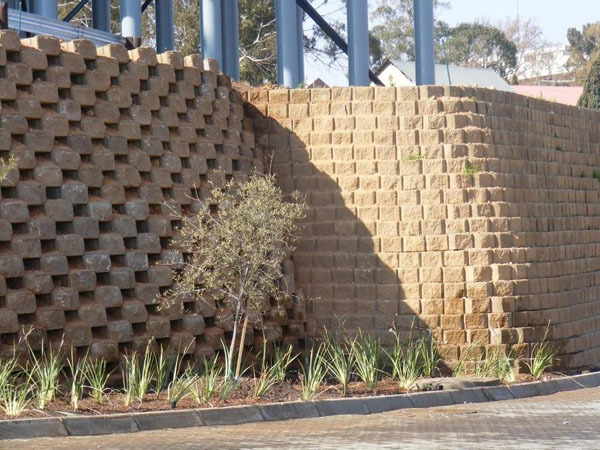 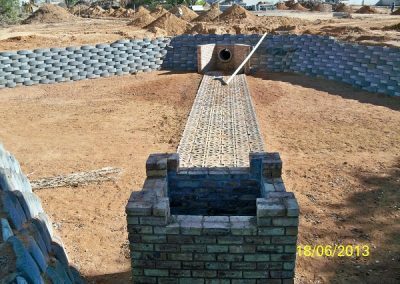 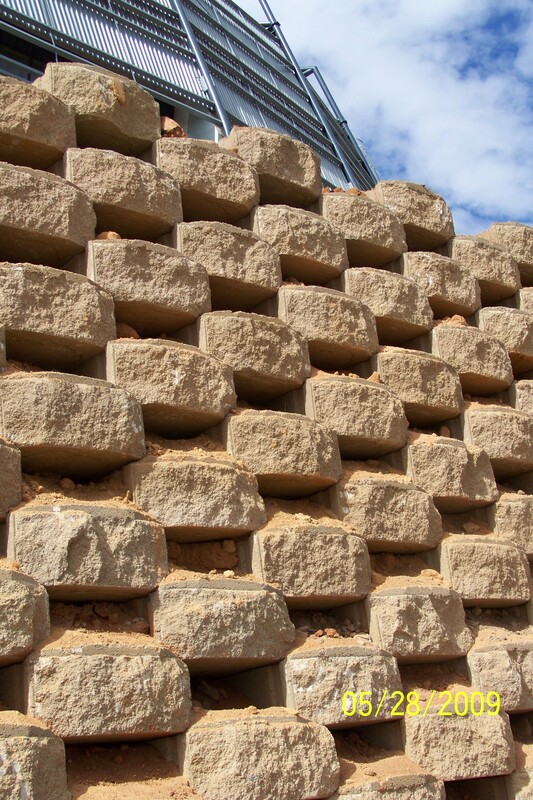 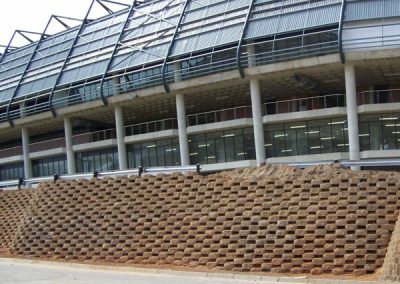 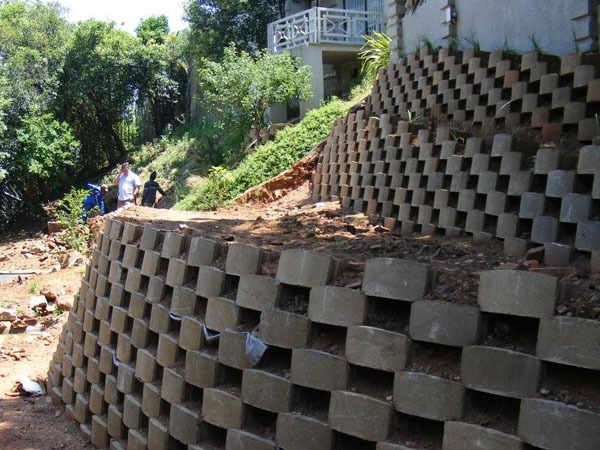 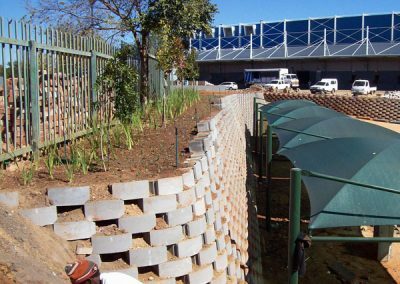 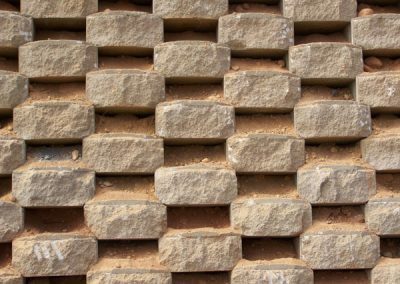 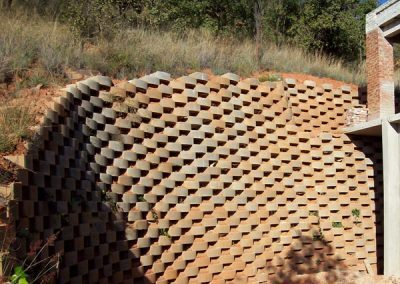 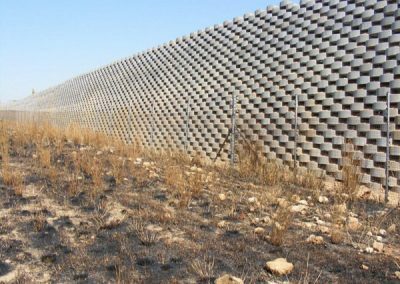 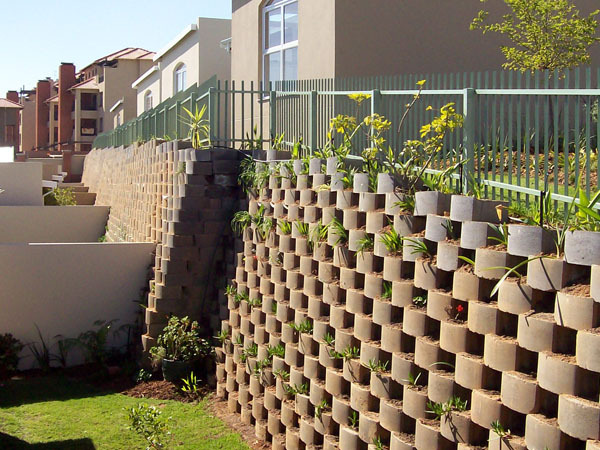 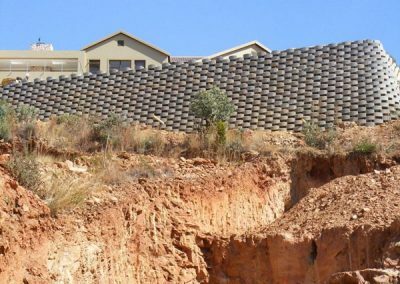 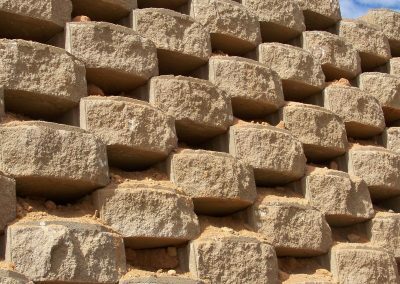 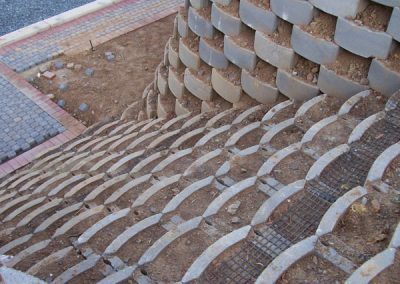 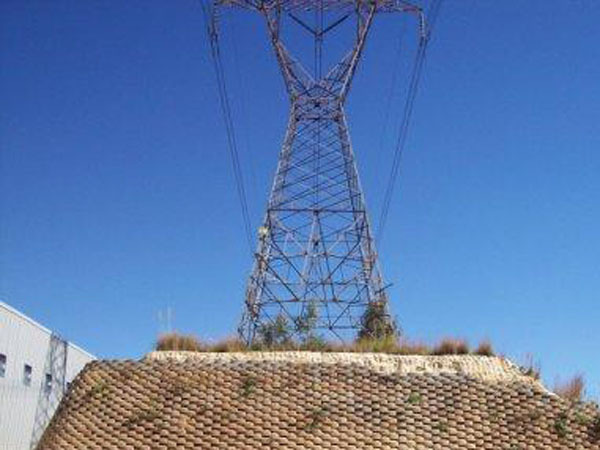 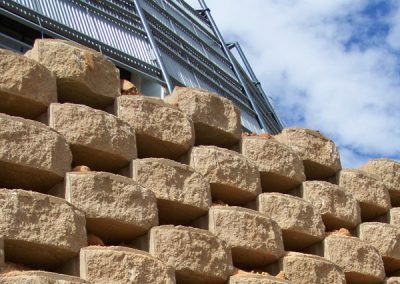 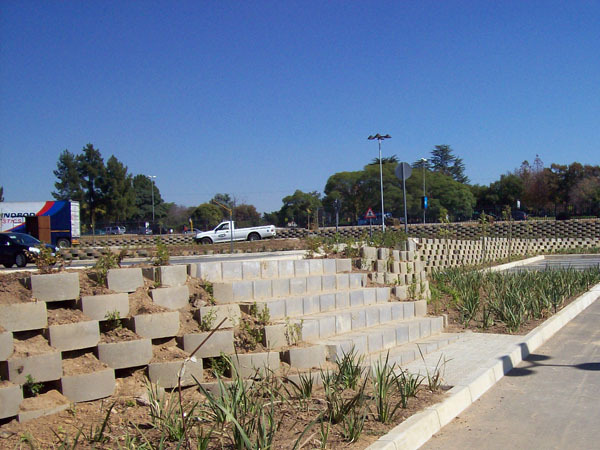 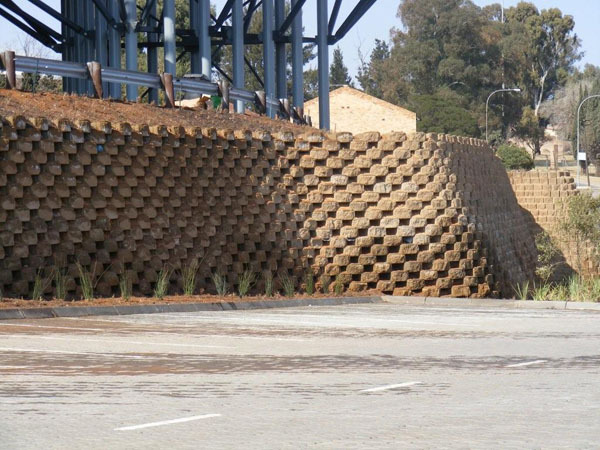 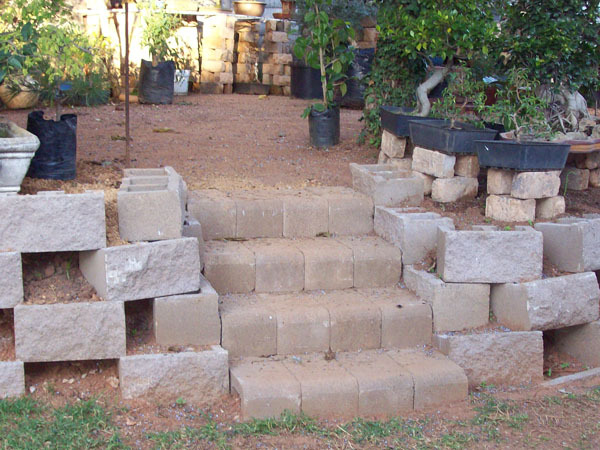 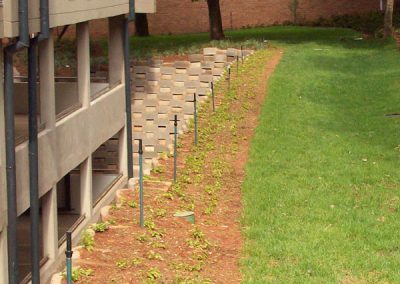 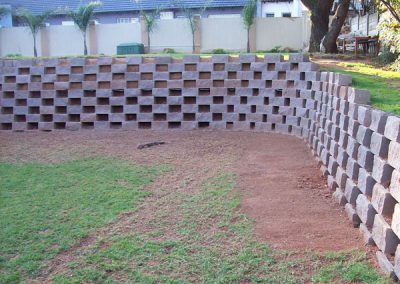 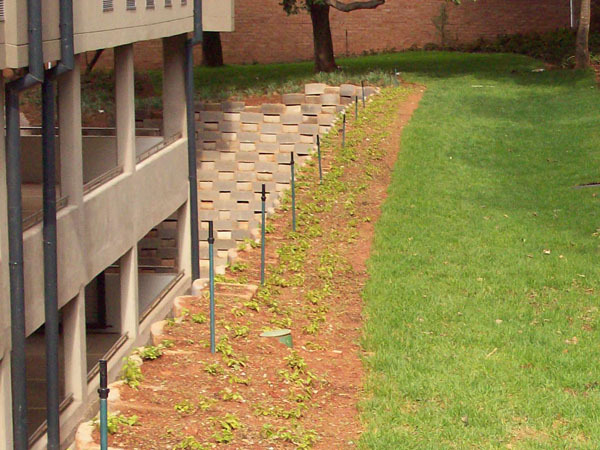 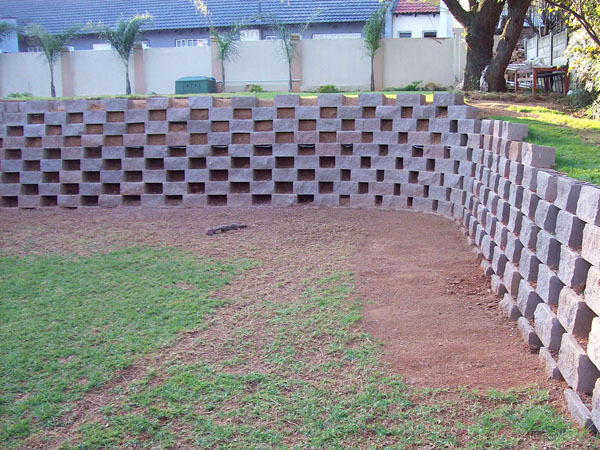 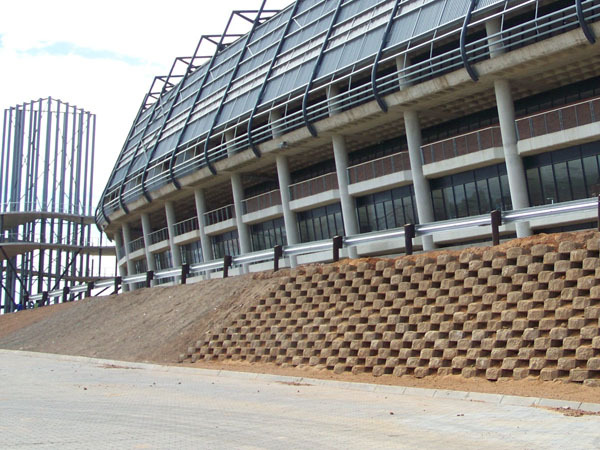 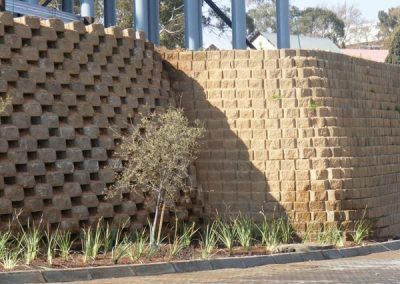 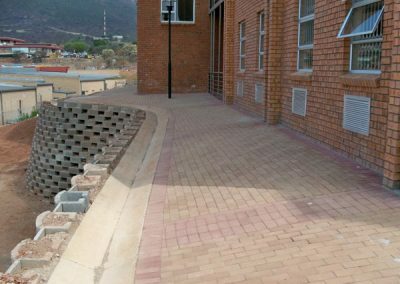 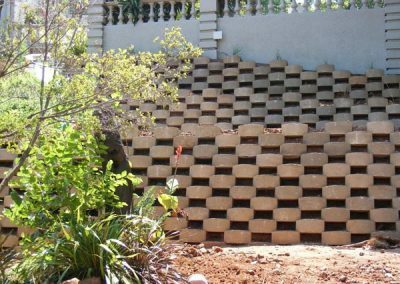 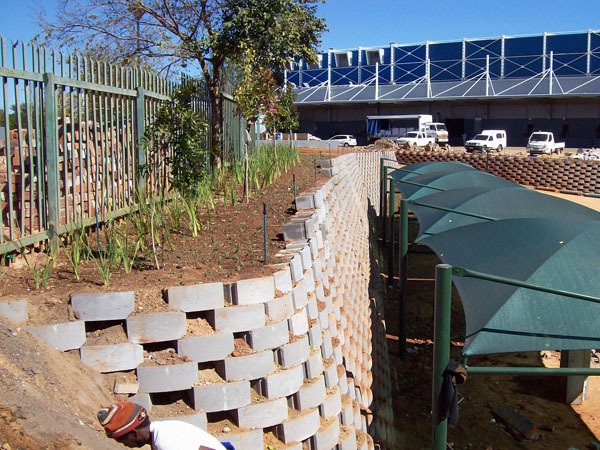 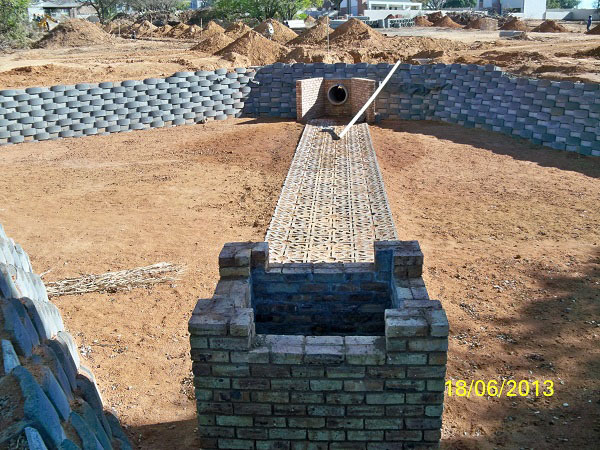 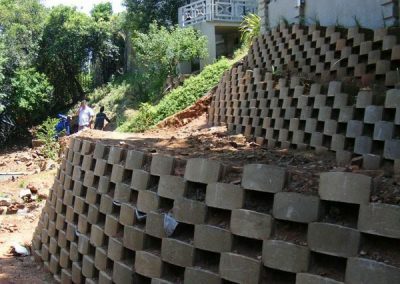 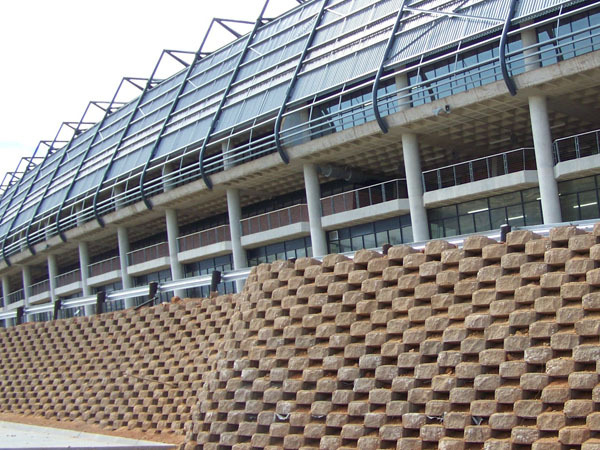 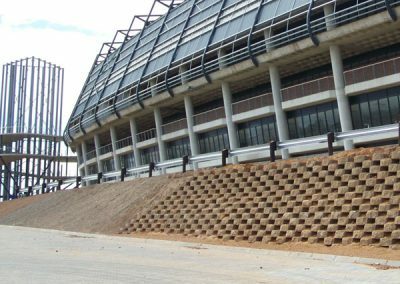 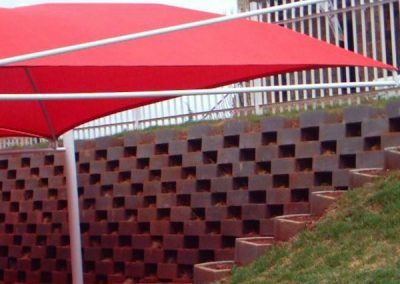 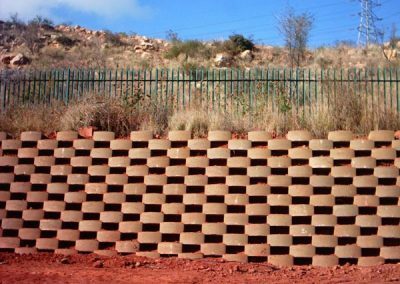 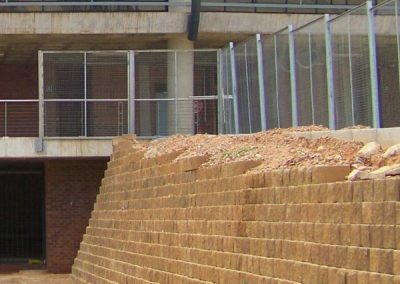 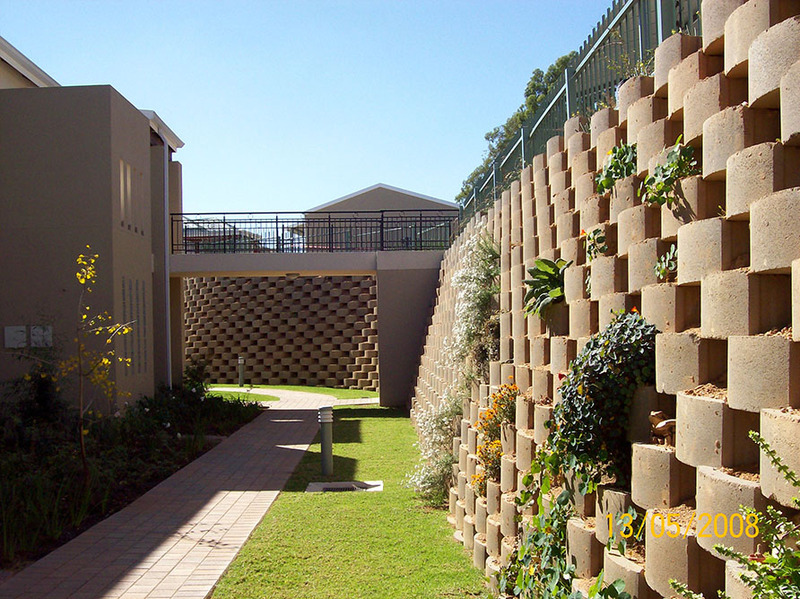 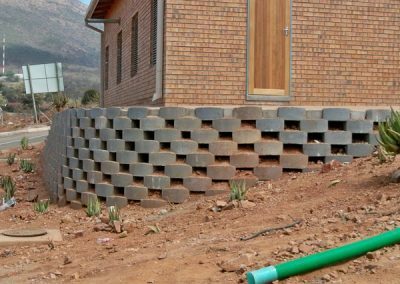 ReMaCon is also licensed to market two TERRAFORCE crb ranges, the L11 in smooth face and the L18 in split face finish, as well as the erosion control systems, Terrafix 120 blocks, and the Terracrete grass block.